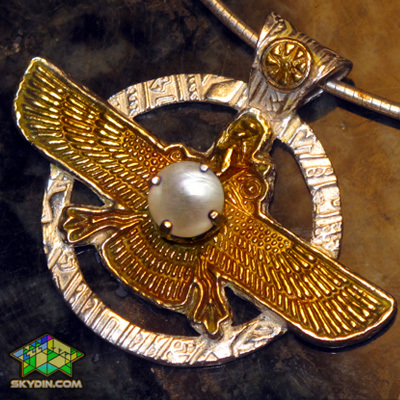 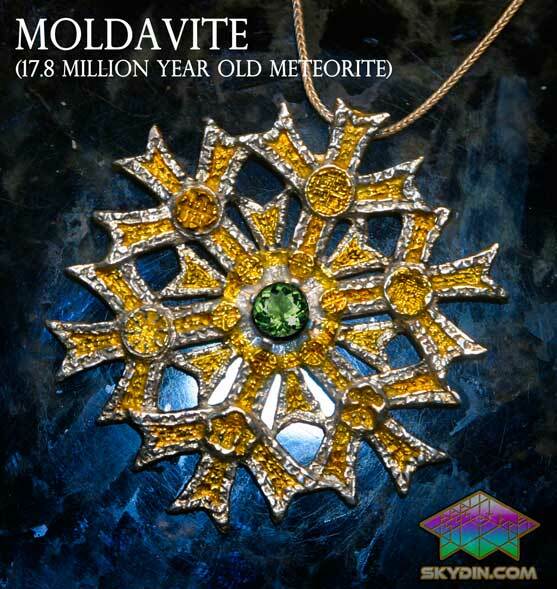 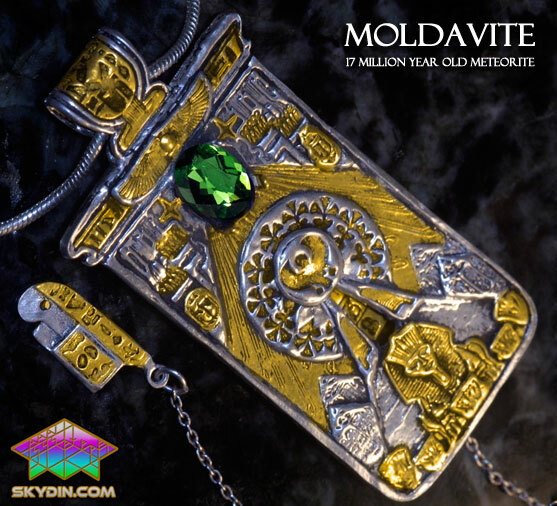 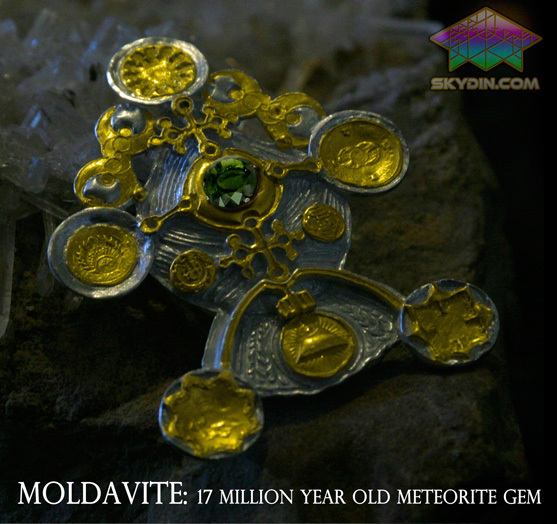 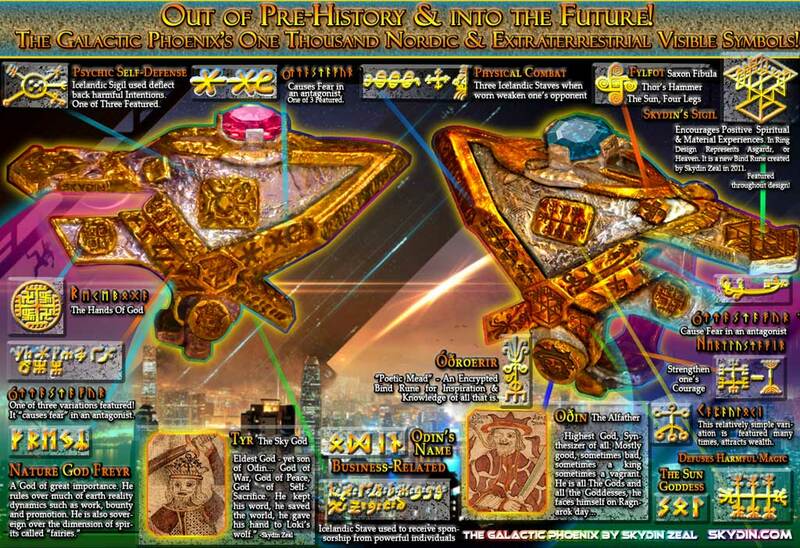 Metaphysical Talismans Across Space & Time! 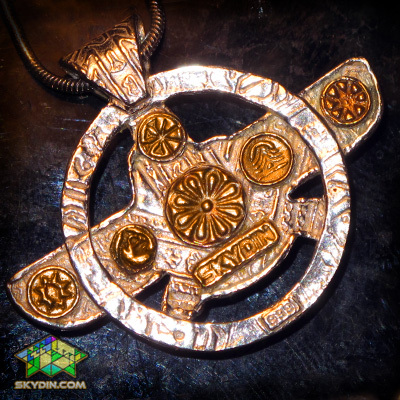 Skydin Zeal is the Creator of Magical Talismans, Pendants and Rings that protect, create harmony and improve life experiences of the people they touch. The pendants in this collection range in price from affordable to more luxurious. 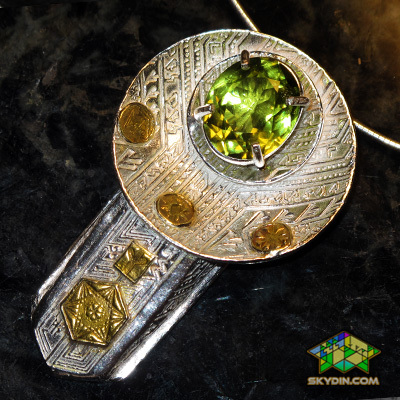 We try to meet everyone's needs but realize that whenever you purchase jewelry at a store it's almost never a hand made piece, what you pay for is the markup on materials, which the Jewelry Industry solely thrives on. Skydin Zeal does not mark up on materials, which makes the usual cost-prohibitive gemstones such as opals and diamonds accessible. 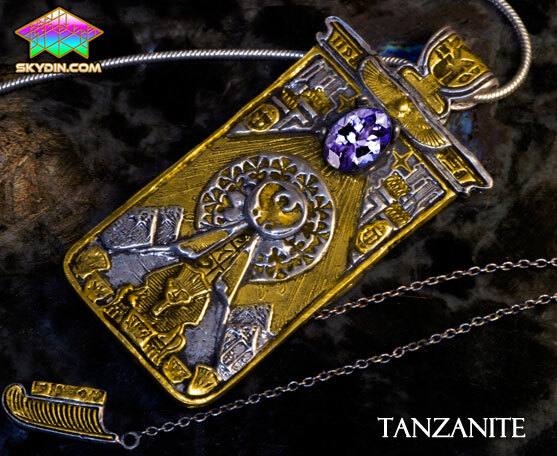 Most of the pendants in this collection are hand-made, one of a kind Talismans. 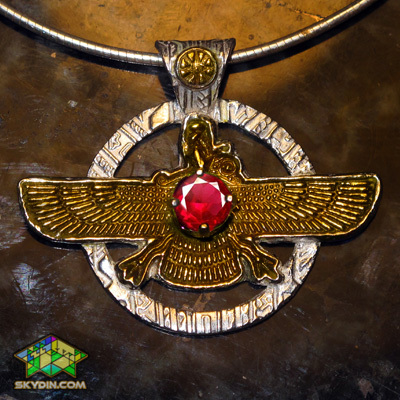 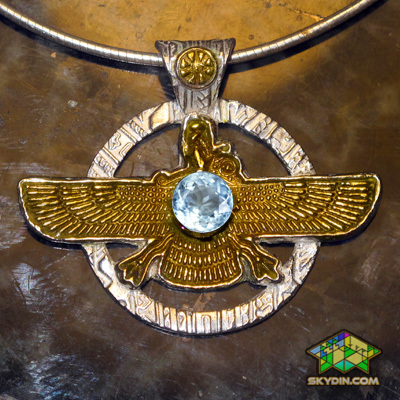 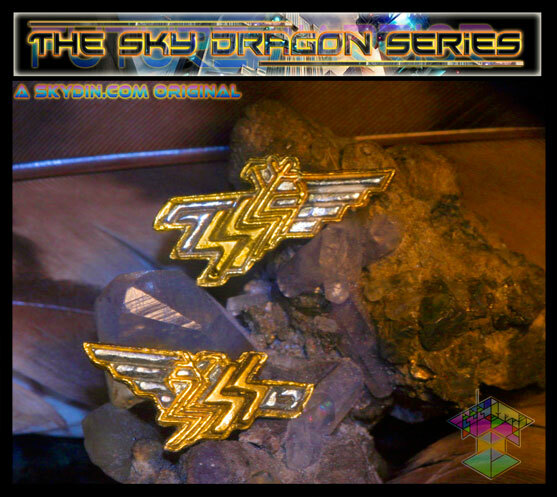 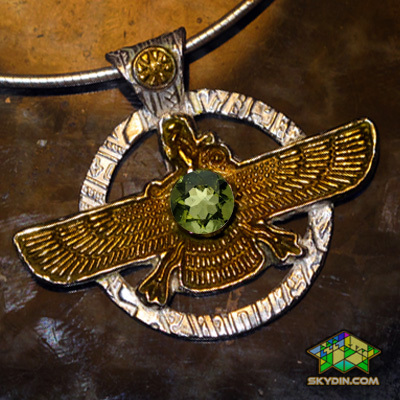 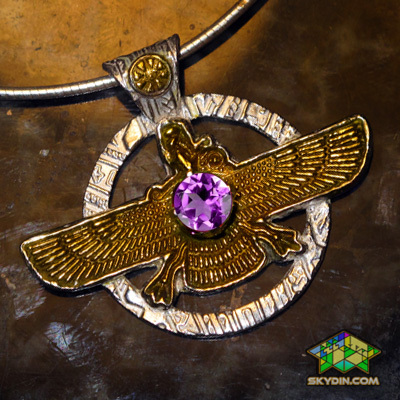 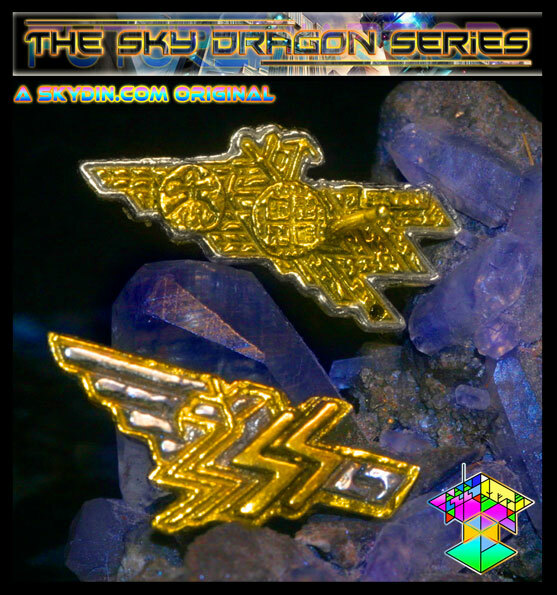 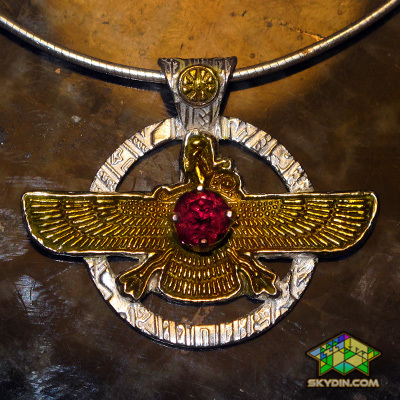 There are also more affordable limited edition series which has the same life-empowering symbols and related gemstones that Skydin Zeal's creations are known for. 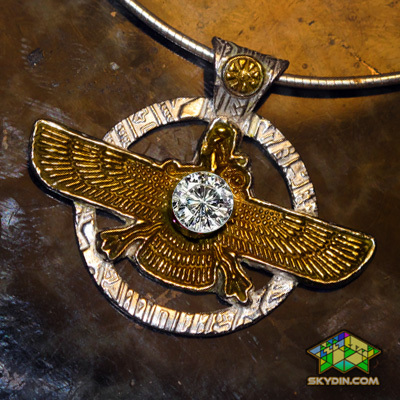 Click on the following to jump to specific areas of this page or browse our collection in it's entirety. 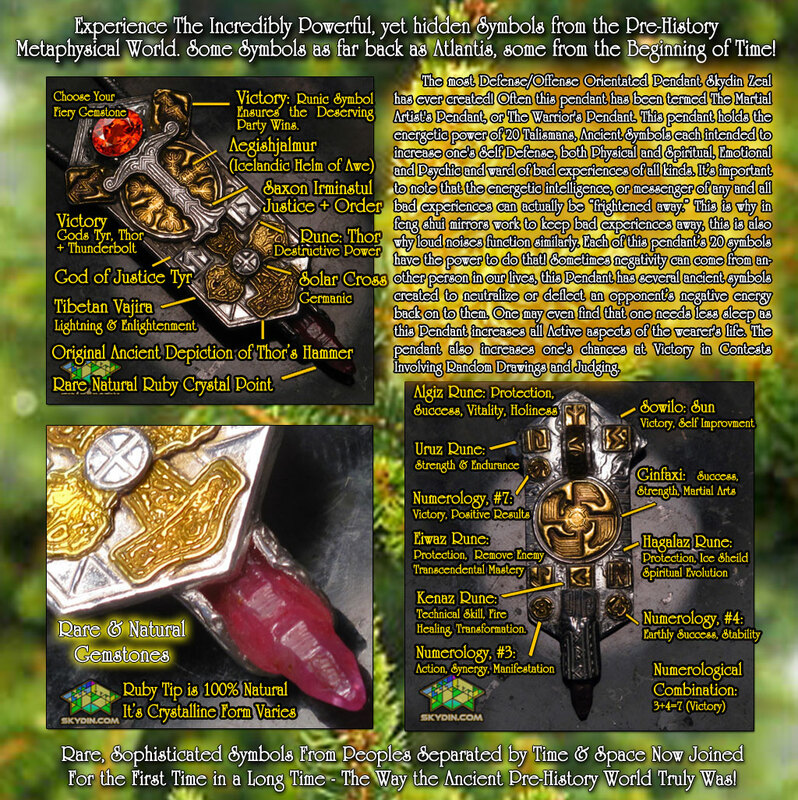 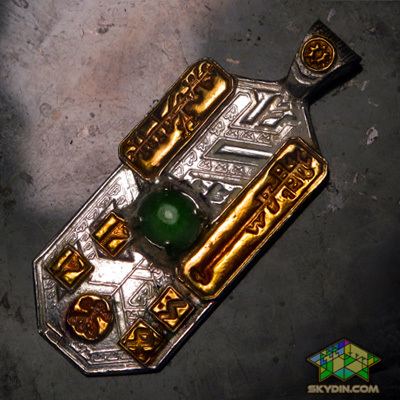 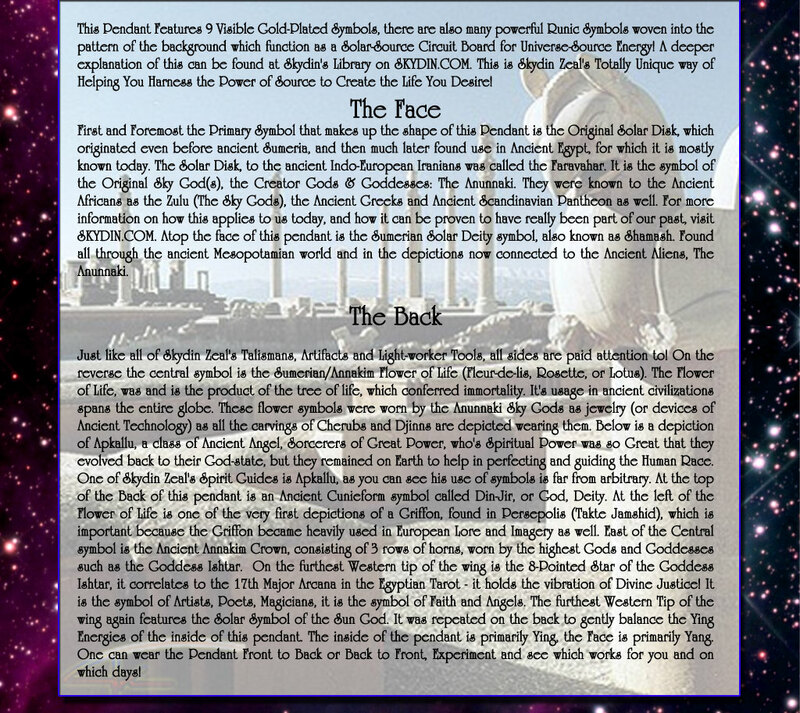 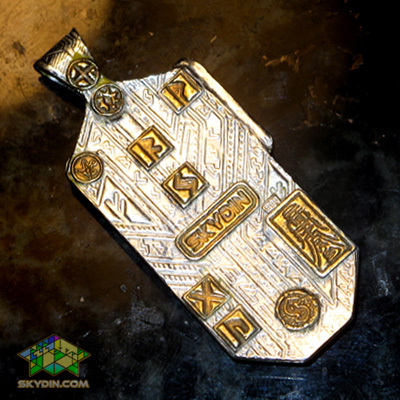 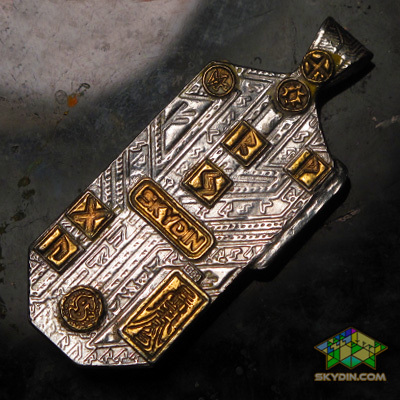 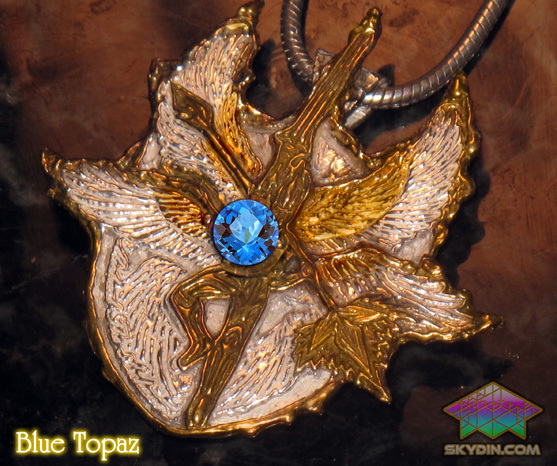 At the start of 2012 Skydin Zeal Made 5 Pendants Each Addressing 5 Important Aspects of his fellow Spiritual Folk. 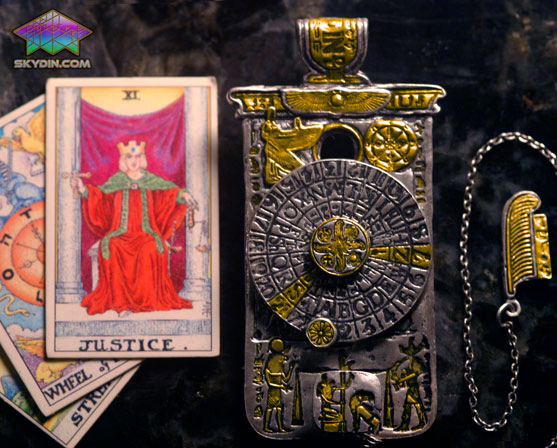 Psychic/Physical Protection was so important that two of the 5 address this in two different ways. 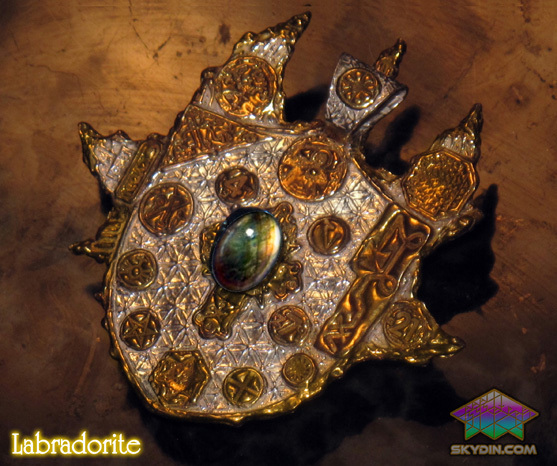 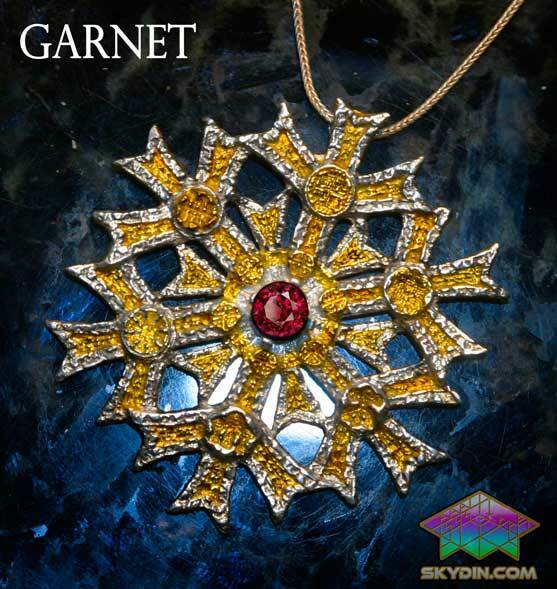 A 3rd Pendant was Designed to fill the wearer with Abundance of all kinds, Primarily Wealth. 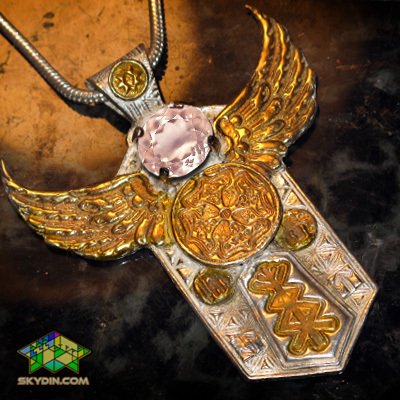 A 4th Pendant was designed to Integrate & Balance Masculine & Feminine Principles, while maintaining the Divine Connection to the Synchronisity of Life. 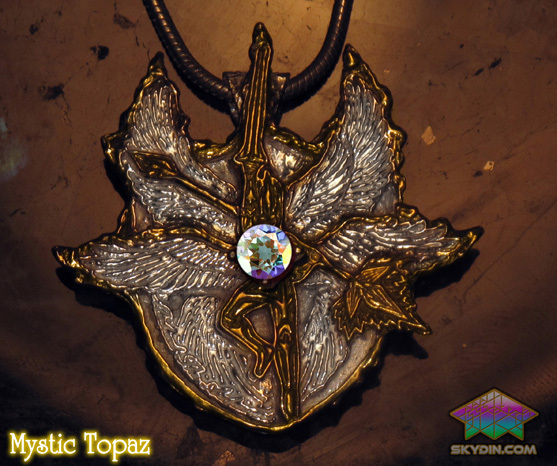 A 5th Pendant was Designed to Intensely improve the Wearer's Psychic Abilities, Dream Work, Astral Travel, Communication with Animals and other Shamanic Arts. 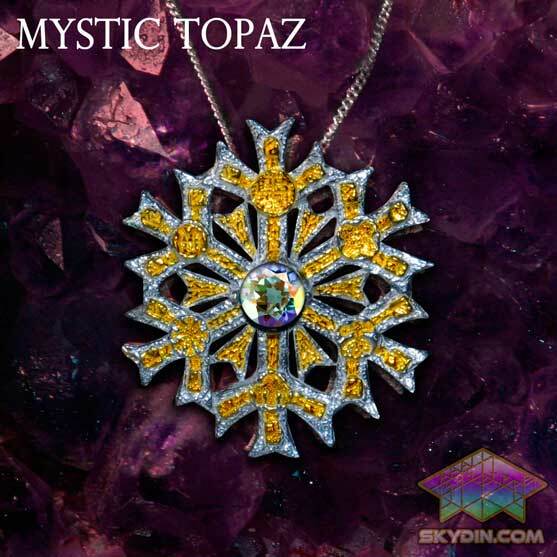 These Pendants are Made in Sterling Silver, 18k Gold Accents, with many Natural Gemstone Options allowing the Wearer to focus more on one of the Many Metaphysical Gifts these Pendants Can Bestow. 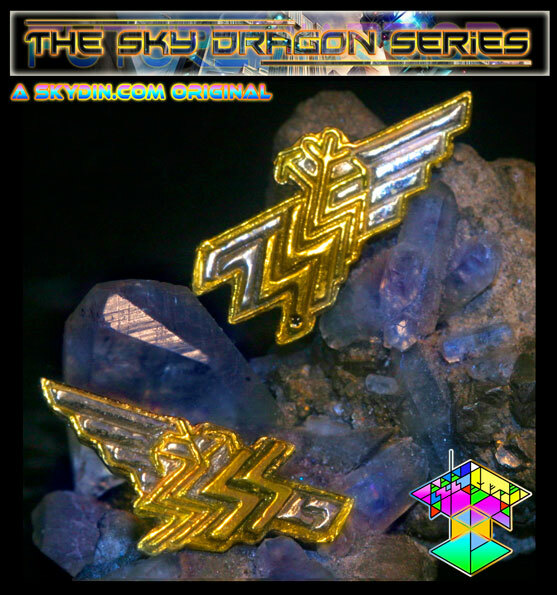 Purchase them here at one half the Retail Price! In 2012 Skydin Zeal Created a Pendant to address an issue familiar to all of us having a Human Experience, that being Abundance. 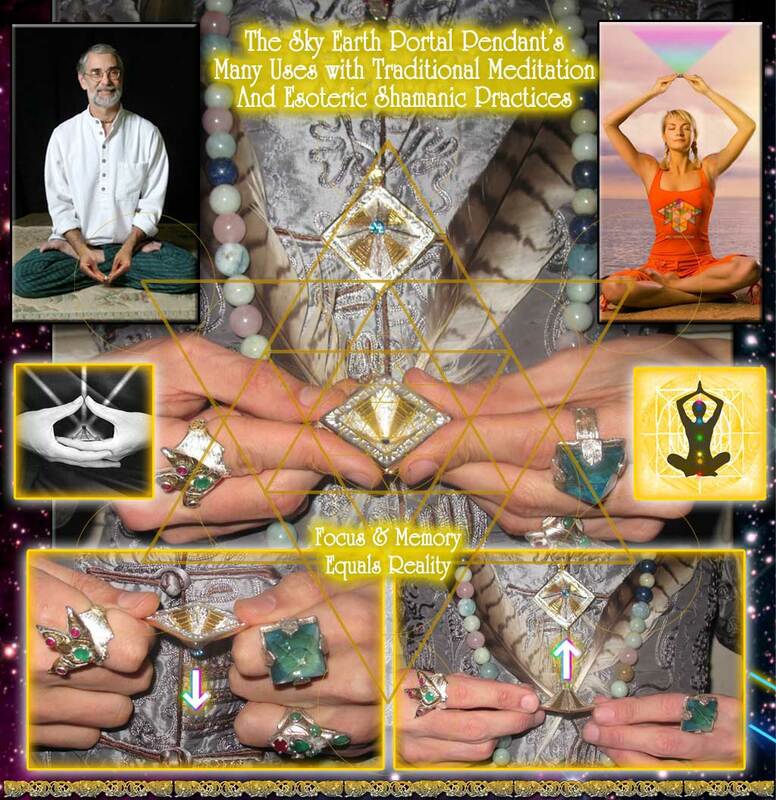 As Spiritual Beings we tend to come into this life with many of our other higher bases covered. 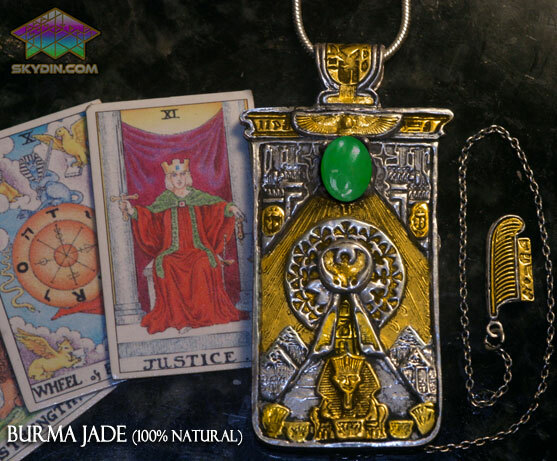 But Abundance is an Energy that governs not only Finance, but Friendship, Richness of Experience, Human Life Itself. 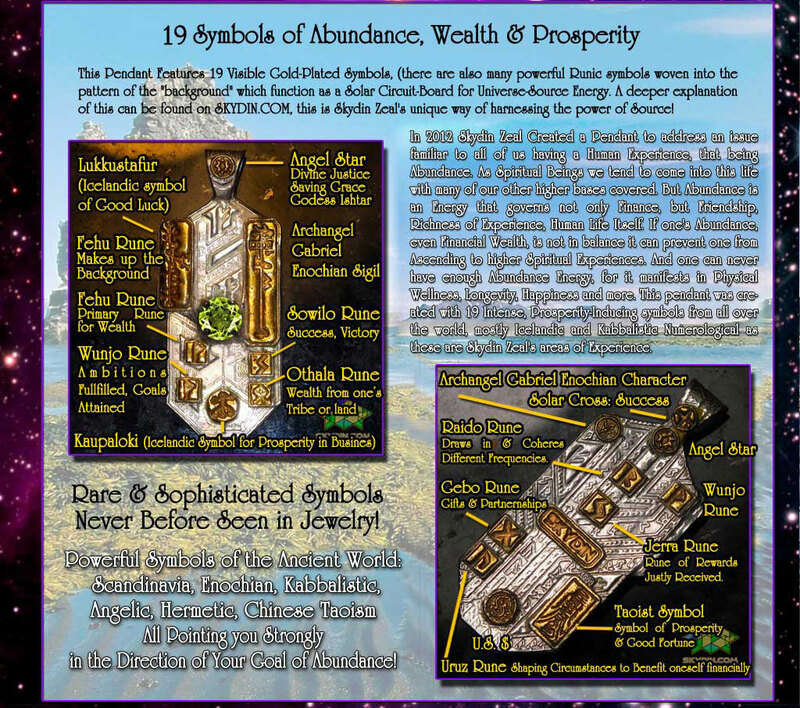 If one's Abundance, even Financial Wealth is not in balance it can prevent one from Ascending to higher Spiritual Experiences. And one can never have enough Abundance Energy, for it manifests in Physical Wellness, Longevity, Happiness and more. 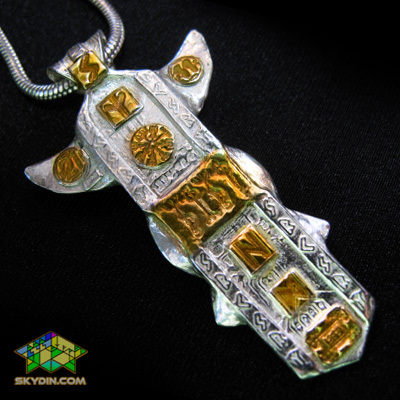 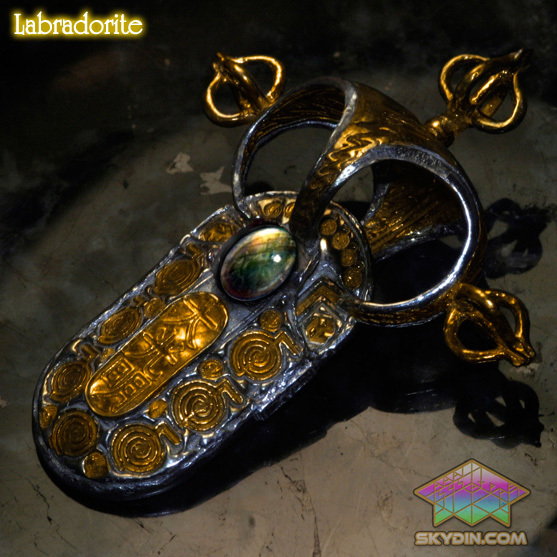 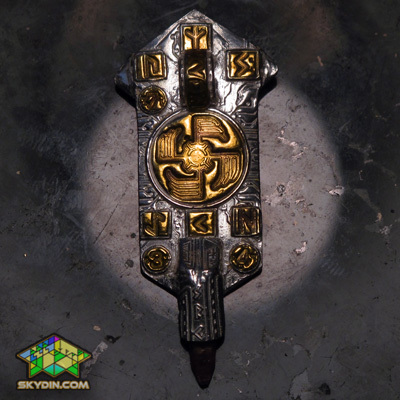 This pendant was created with 19 Intense, Prosperity-Inducing symbols from all over the world, mostly Icelandic and Kabbalistic Numerological as these are Skydin Zeal's areas of Experience. 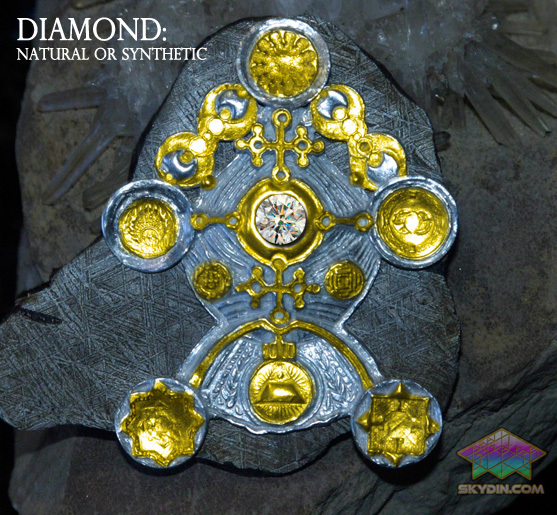 For An explanation on how a Symbol Generates an Experience click here. 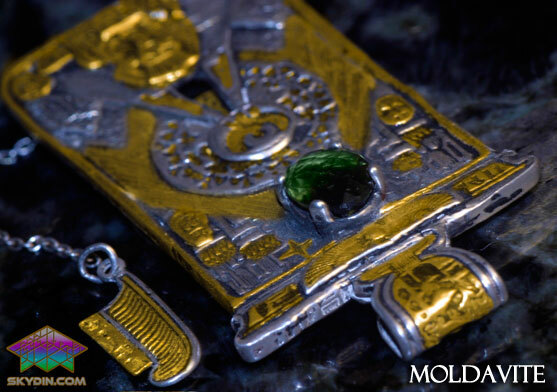 Gemstone Selection: Choose from (Pictured above, Left to Right): Emerald, Peridot, Chrysoprase or Jade- All 100% Natural and Authentic! These Gemstones have been selected to generate and encourage Propserity & Abundance, more information on the particular properties of gemstones can be found on the net, but often it's best to go with one's natural intuition. 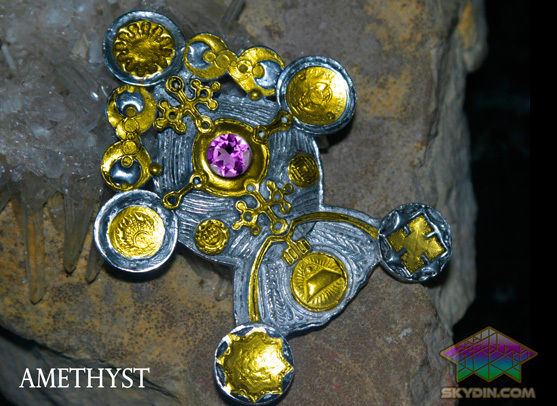 Technical Information: Size: 52mm x 21mm, Weight: 10.9 grams, Composition: .929 Sterling Silver with 18k gold accents. 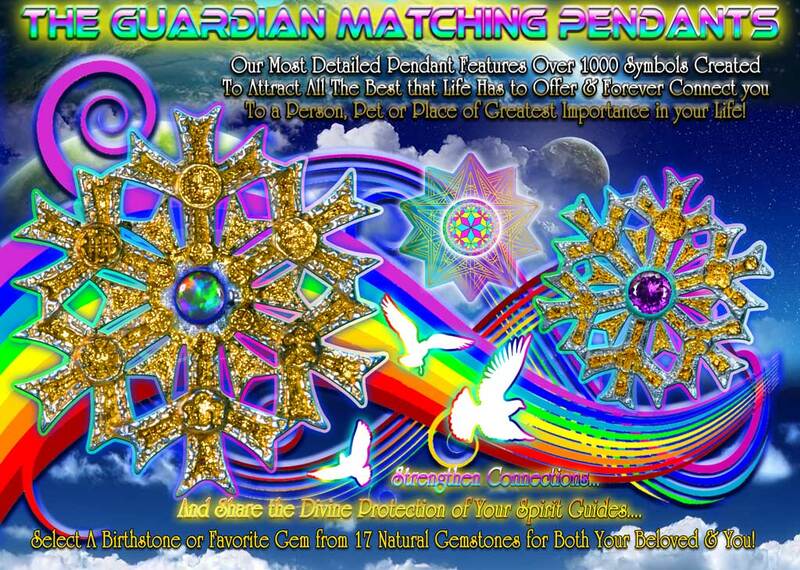 New Option: Spiritually Customized - Psychically Synchronized to You! 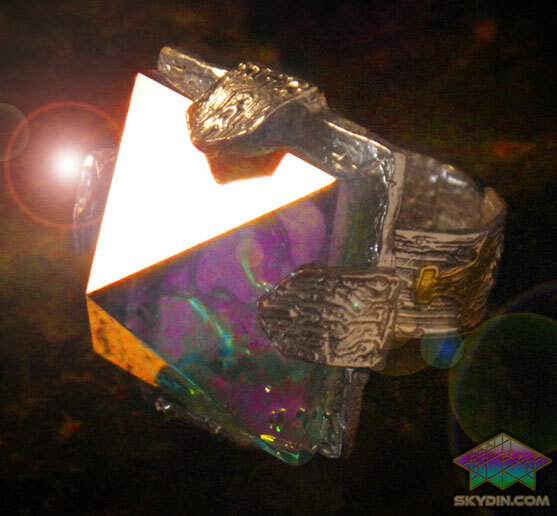 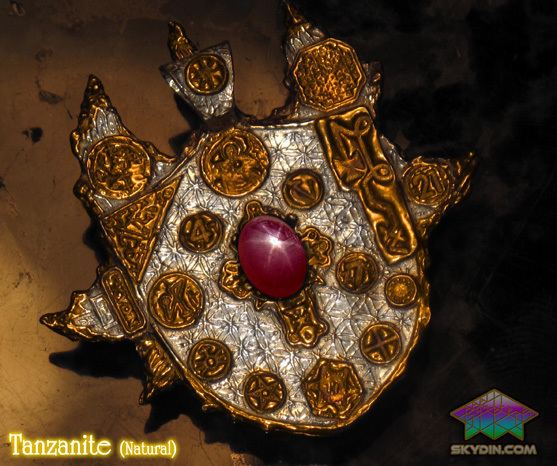 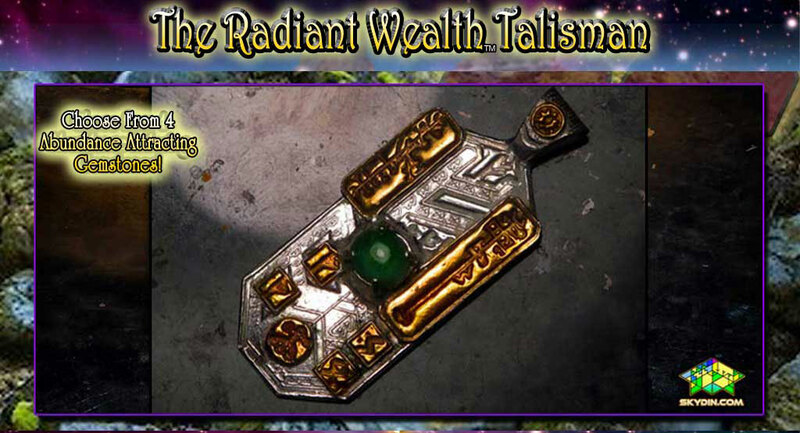 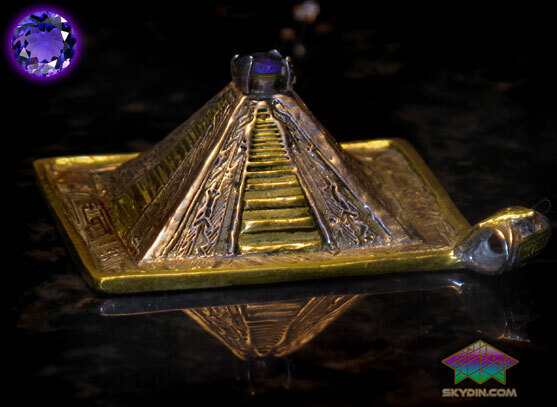 All Talisman Pendants and Rings created by Skydin Zeal are like living beings - they required genuine spiritual power, alot of careful thought, passion and months to be brought to life! 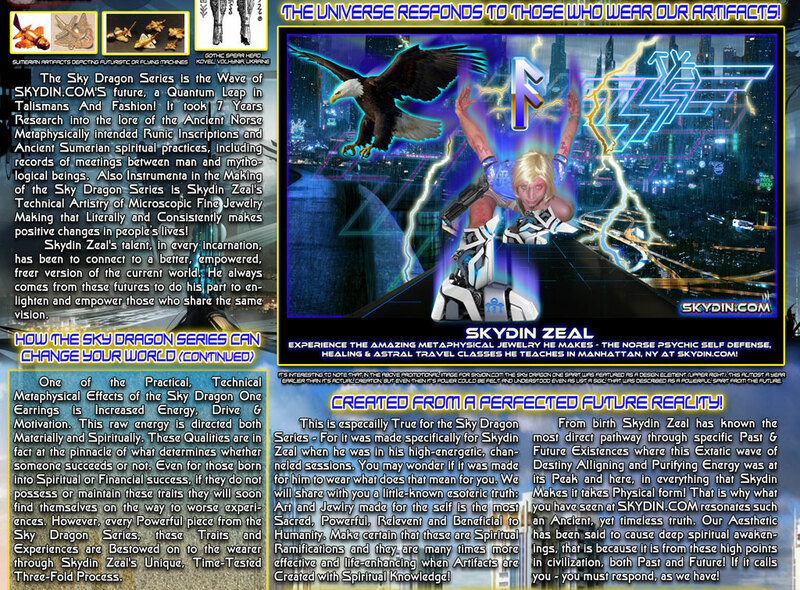 It is because of Skydin Zeal's rare talents that all of our products thusly are complete, energetically perfected, beautiful and holy! 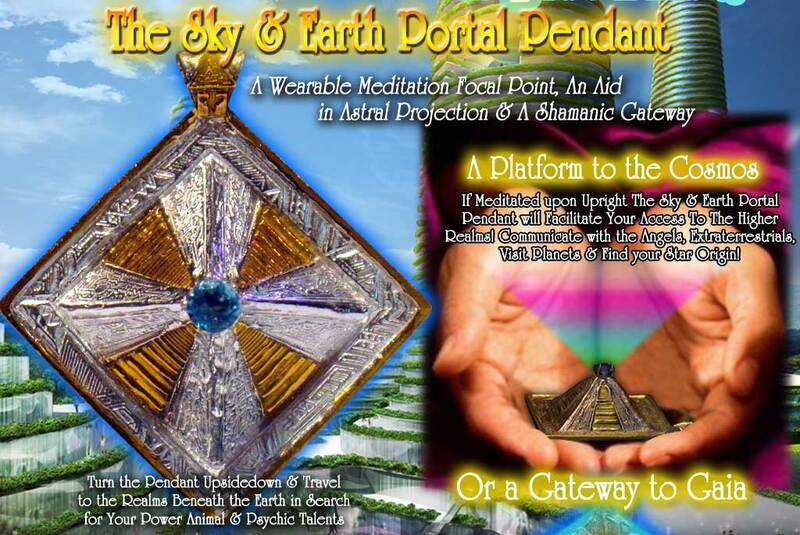 However all that you see here you can customized exactly to your specifications, frequency and goals! 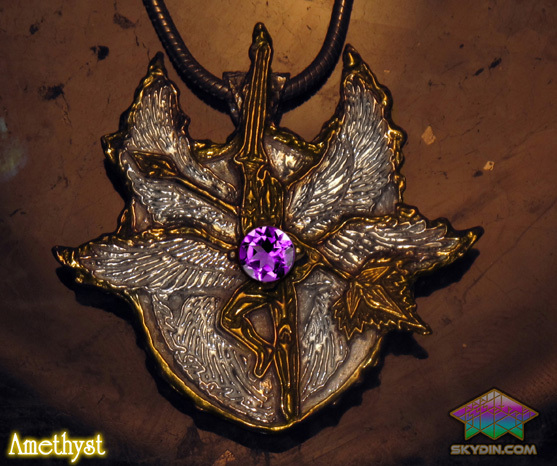 This means a totally unique work of everlasting spiritual fashion and art just foryou! 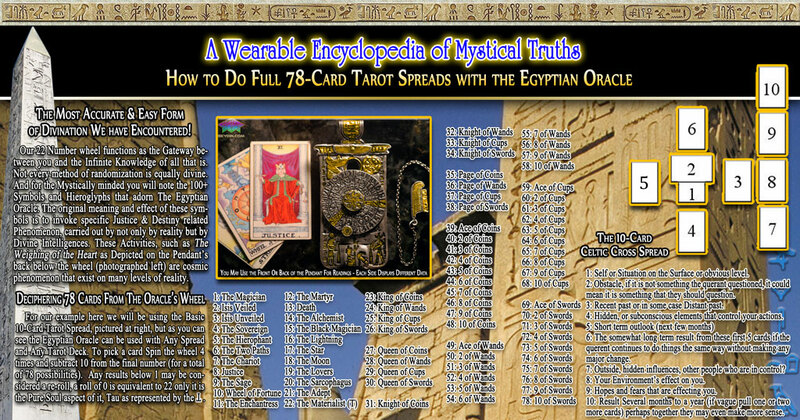 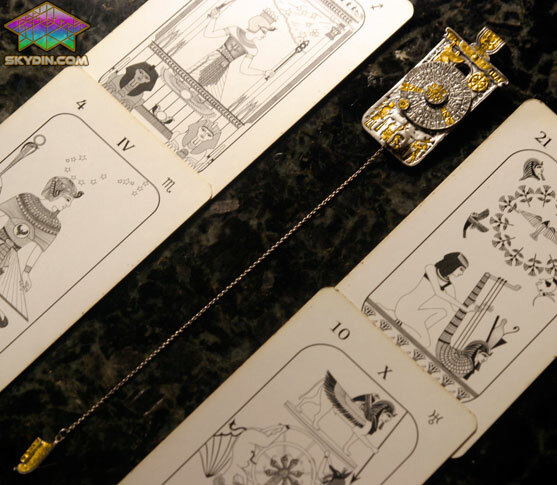 It involves a powerful psychic reading inwhich Skydin Zeal will read your chart with his incredible three-pronged method which includes the Scandinavian Runes, Ancient Egyptian Tarot and Numeology based on both Northern and Eastern systems! 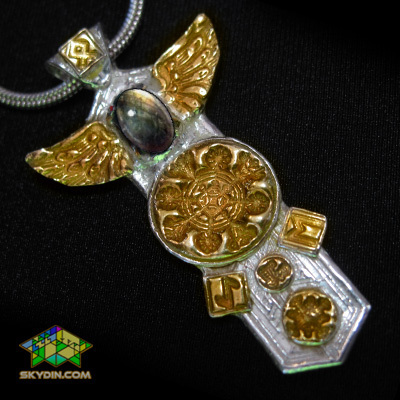 This leaves no room for error as he looks to help your spirit succeed from many points of view! 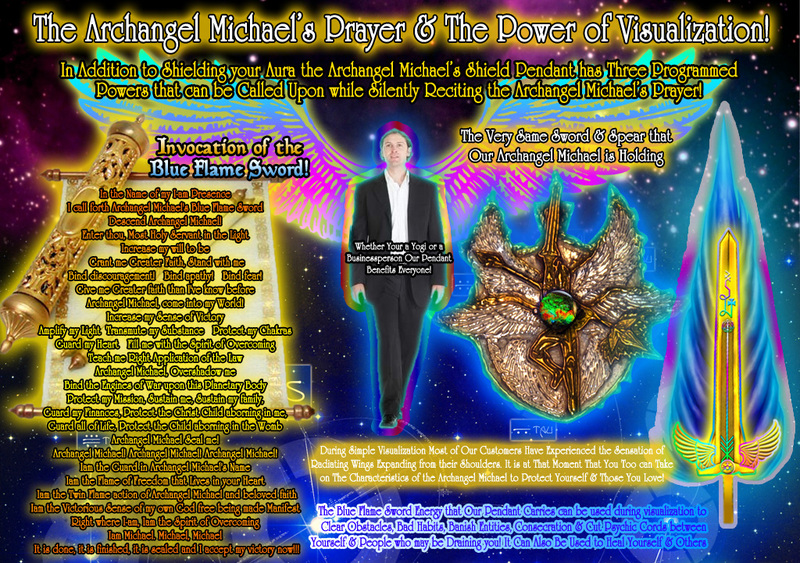 You then send a brief paragraph describing exactly what it is you would like to attain, and or what you would like to change. 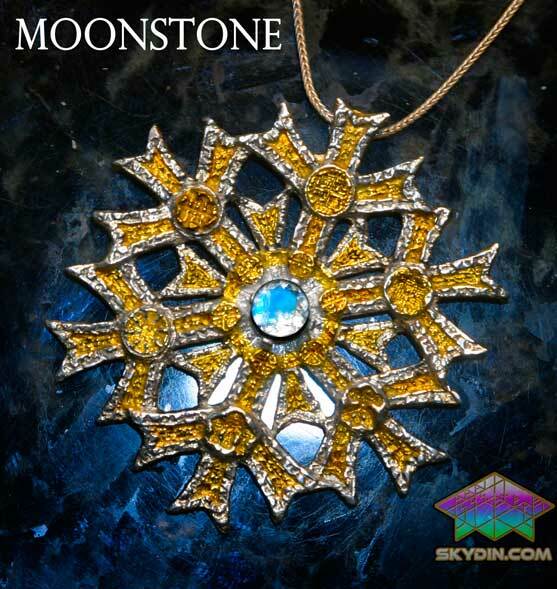 Several additional gemstones may be selected, the first additional gemstone is free as long as it has a skydin.com value of $14 or less. Please see the Archangel series secondary gemstones to view our below wholesale prices on more expensive gemstones! Skydin Zeal never profits from the gemstone you purchase, it is his desire to extend to you the cost that we actually pay on gemstones. 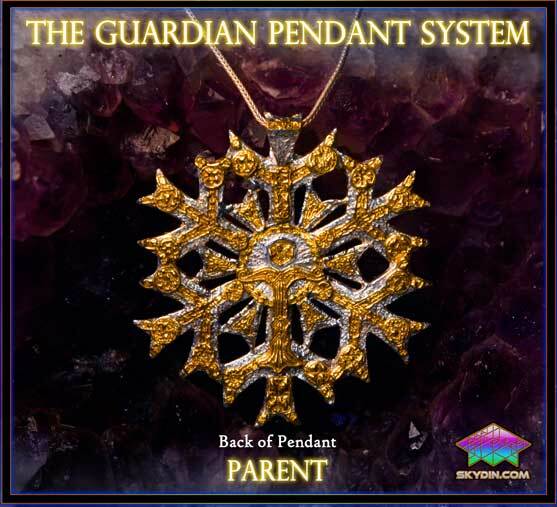 You can choose your own Symbols and designs from our 400+ Library of the most Powerful and Effective Symbols, which will then be individually made in fine silver and plated in 24k Gold. 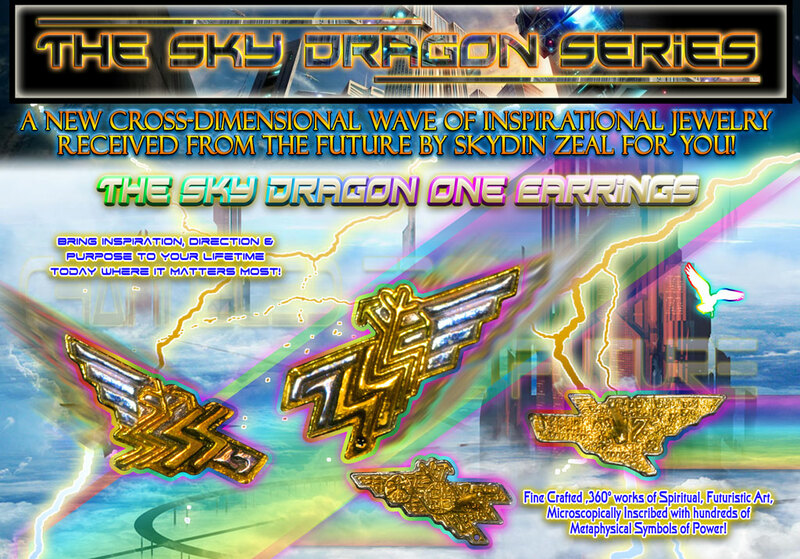 Or you can have Skydin Zeal channel purely for you! 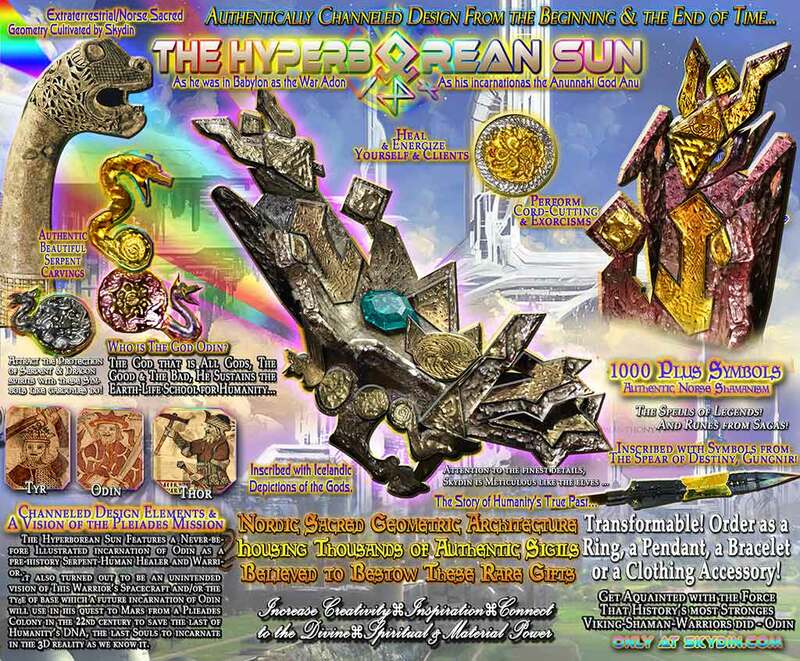 We will present to you a drawing by Skydin Zeal before he begins! 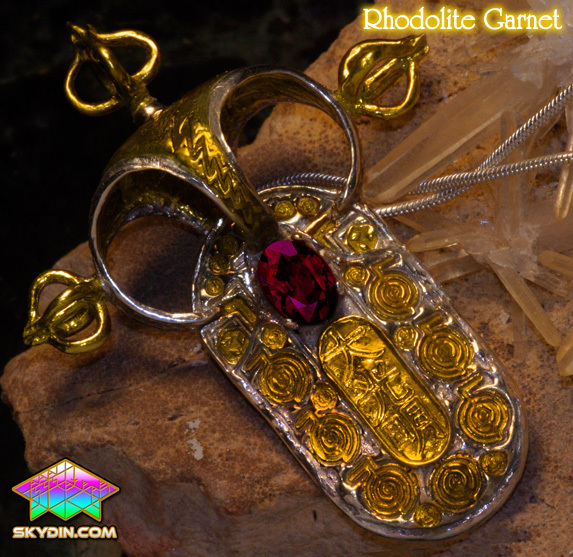 To initiate your Spiritually Customized Process simply add that to your cart at checkout! 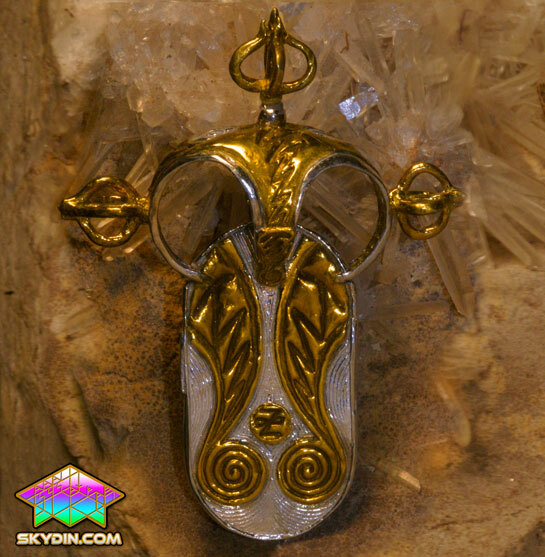 This pendant has been created to improve the wearer's higher level Psychic Ability. The Pendant's 14 Talismanic symbols hold the specific focused intent to: Create more Positive Spiritual Experiences, Drastically Improve Lucid Dreaming and Astral Projection Potential. 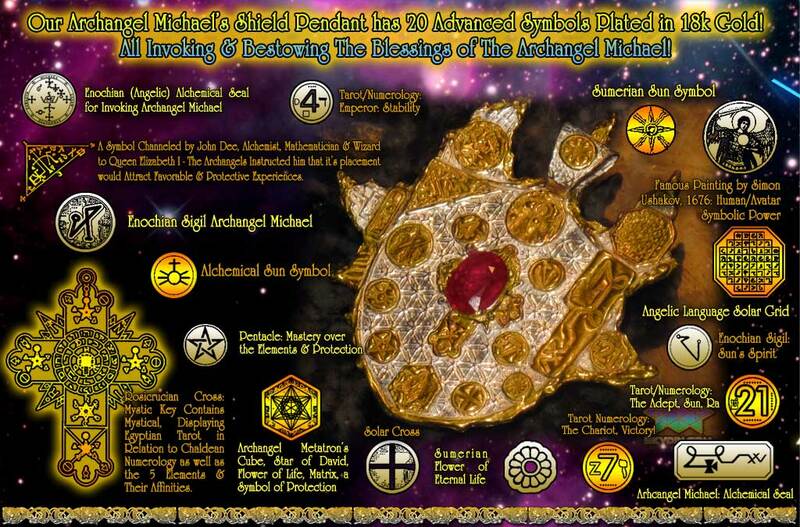 3rd Eye, Clairvoyance, Claircognizance, Clairsentience, Clairaudience. 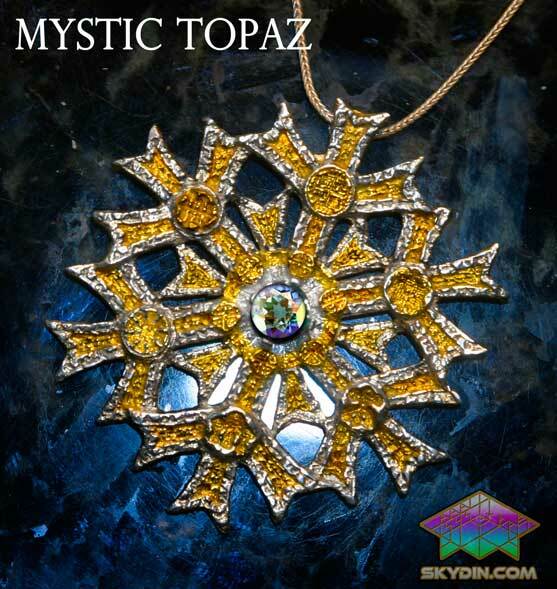 Visualization Manifestation Abilities, Telepathy, Psychometry, Shamanic Communication with Animals, Locating one's Totem or Spirit Animal. 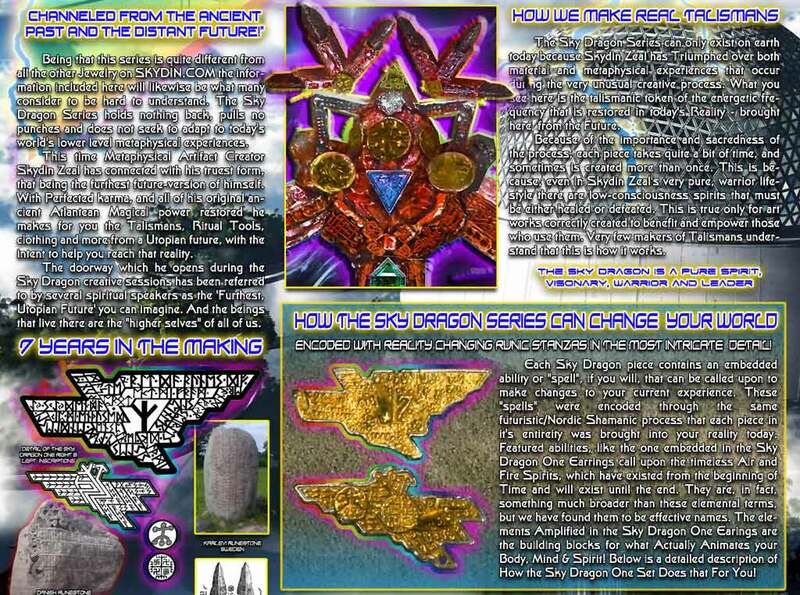 Communication with Elves, or Sentient beings of higher dimensions. 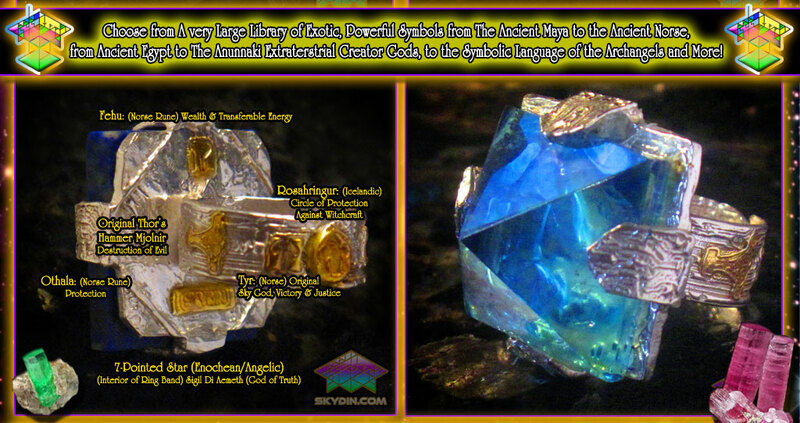 Communication with Nature Spirits and Elementals. 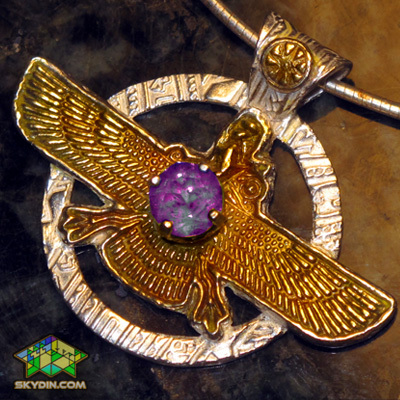 Shamanic Healing abilities, Invisbility and Shapeshifting. 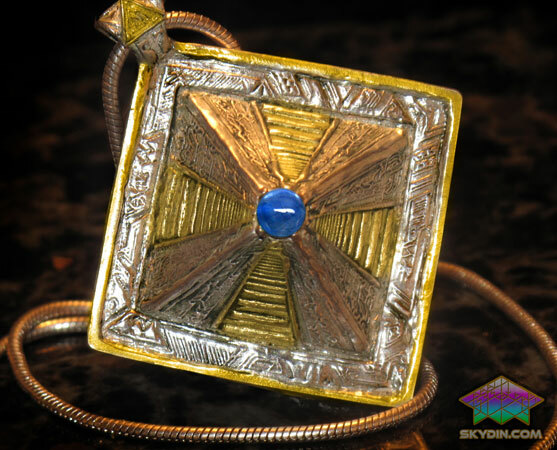 Projection of one's Double or Triple into the physical realm, Actual Teleportation via Dreaming, opening Secret Passageways in hills and mountains and opening locked doors. 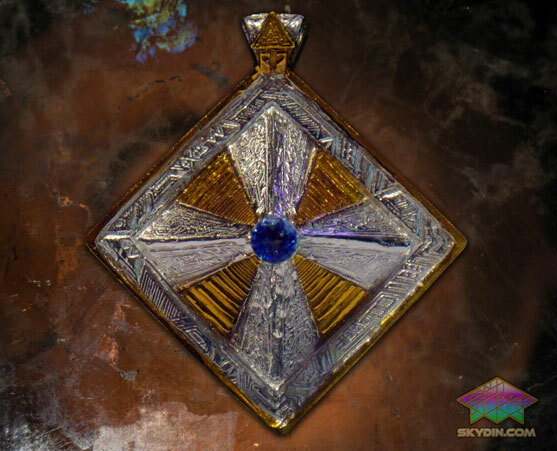 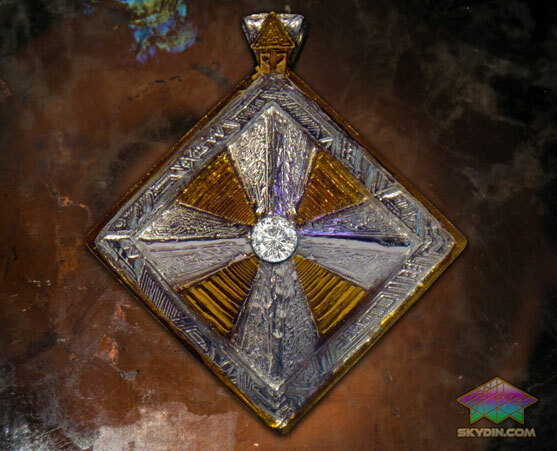 All these abilities are infact possible, and the symbols gathered together on the front and back of this pendant were originally created in Ancient Iceland to encourage these abilities. 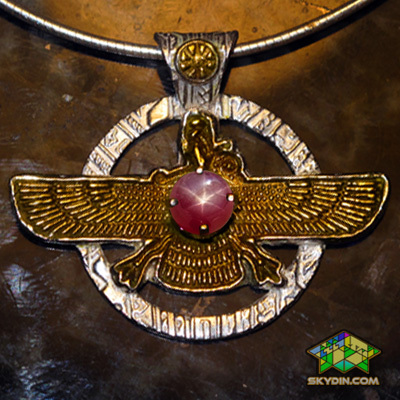 The individual symbols are so powerful infact that in ancient times a practitioner or Vitki would only need to wear one symbol. 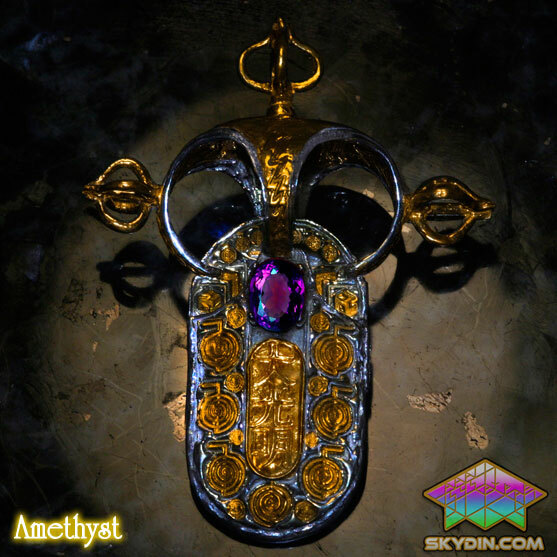 Gemstone Selection: Choose from (Pictured above Left to Right) Amethyst, Moldavite, Kyanite, Apatite, Labradorite, Tanzanite or Cat's Eye Labradorite - All 100% Natural and Authentic! 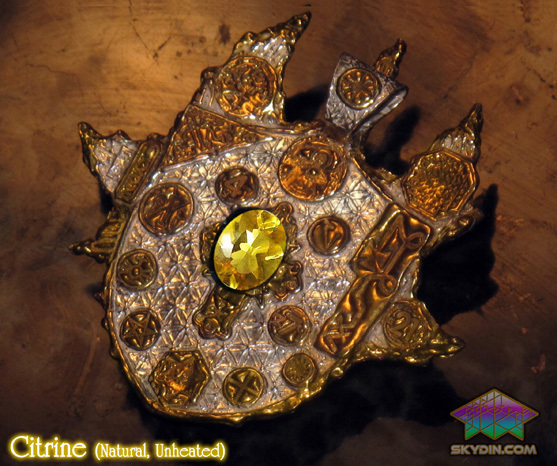 These gemstones have been selected to increase one's Psychic power, Lucid Dreaming, Astral Travel, 3rd Eye Development and so on. 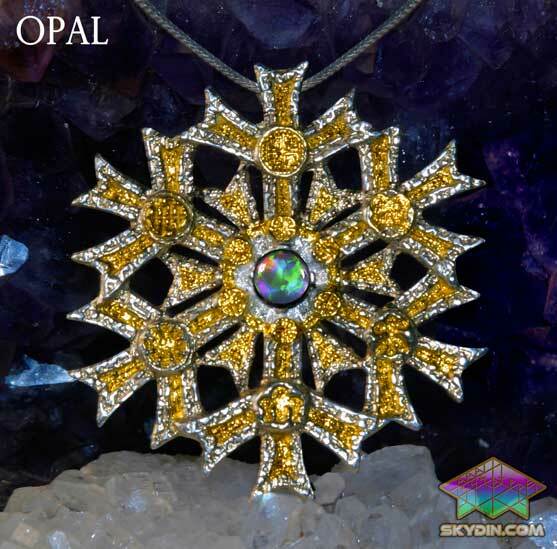 More information on the particular properties of gemstones can be found on the net, but often it's best to go with one's natural intuition. 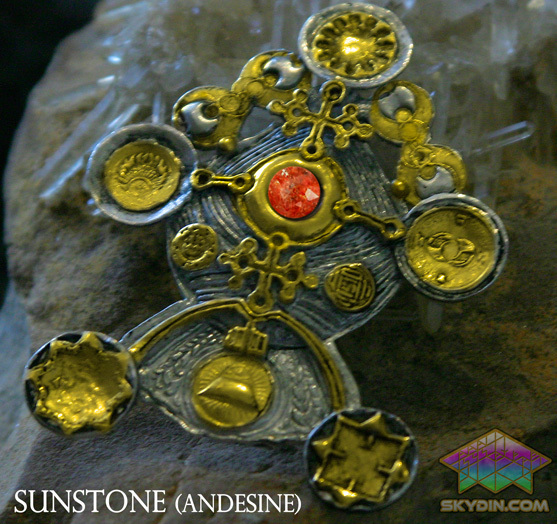 Technical Information: Size: 50mm x 23mm, Weight: 11.3 grams, Composition: .925 Sterling Silver with 18k gold accents. 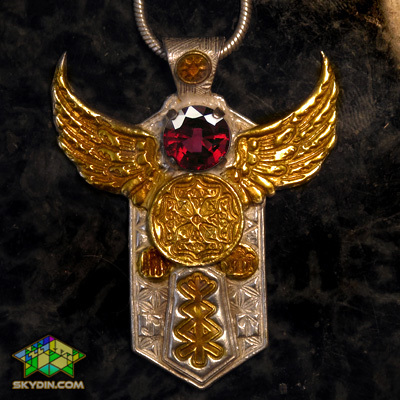 All Talisman Pendants and Rings created by Skydin Zeal are like living beings - they required genuine spiritual power, alot of careful thought, passion and months to be brought to life! It is because of Skydin Zeal's rare talents that all of our products are energetically perfected, beautiful, sacred and complete! 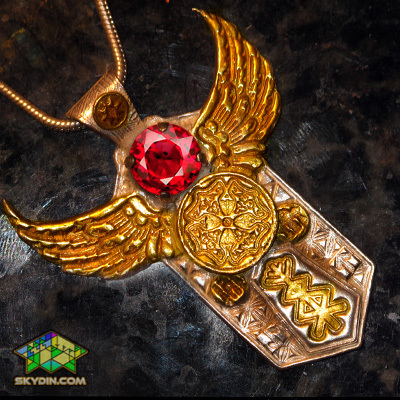 However all that you see here you can customized exactly to your specifications, frequency and goals! 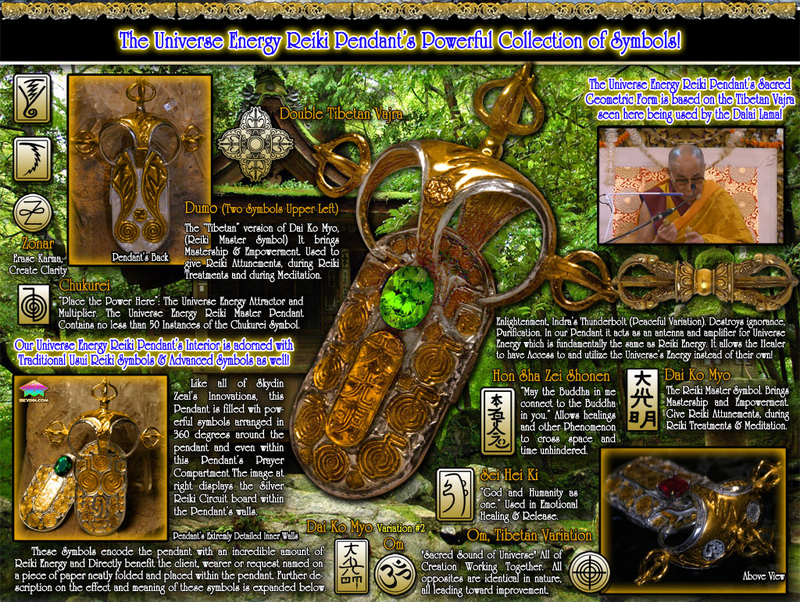 This means a totally unique work of everlasting spiritual fashion and art just foryou! 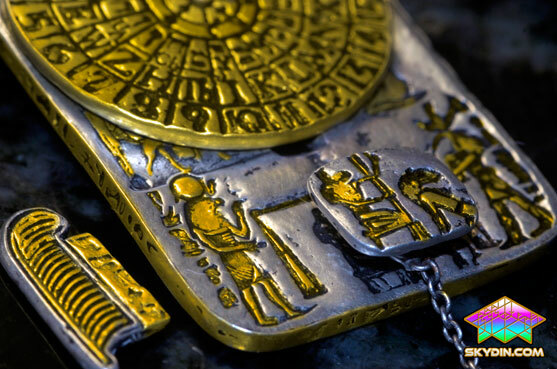 It involves a powerful psychic reading inwhich Skydin Zeal will read your chart with his incredible three-pronged method which includes the Scandinavian Runes, Ancient Egyptian Tarot and Numeology based on both Northern and Eastern systems! This leaves no room for error as he looks to help your spirit succeed from many points of view! You then send a brief paragraph describing exactly what it is you would like to attain, and or what you would like to change. 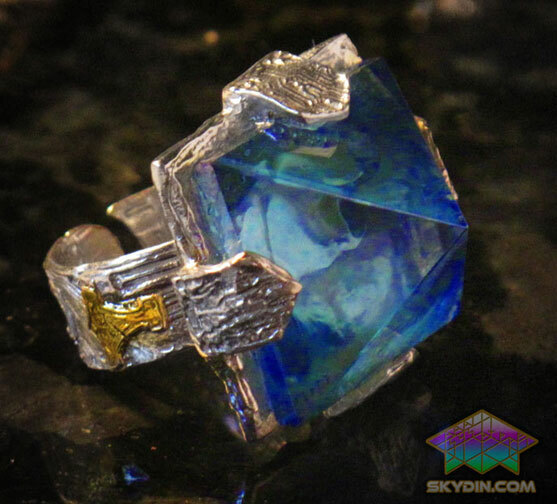 Several additional gemstones may be selected, the first additional gemstone is free as long as it has a skydin.com value of $14 or less. 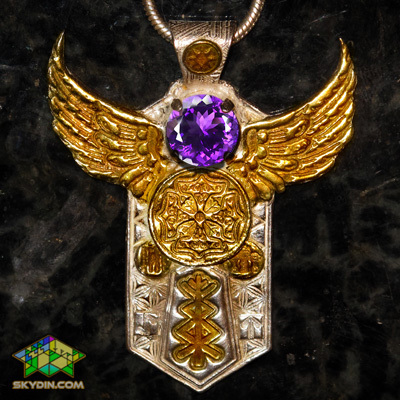 Please see the Archangel series secondary gemstones to view our below wholesale prices on more expensive gemstones! Skydin Zeal never profits from the gemstone you purchase, it is his desire to extend to you the cost that we actually pay on gemstones. 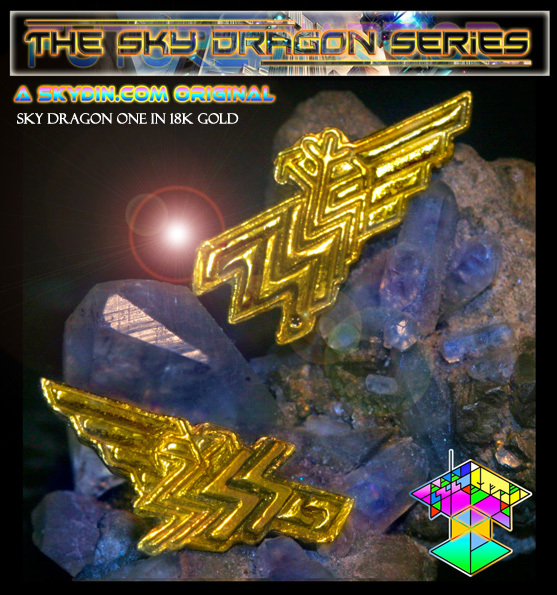 You can choose your own Symbols and designs from our 400+ Library of the most Powerful and Effective Symbols, which will then be individually made in fine silver and plated in 24k Gold. 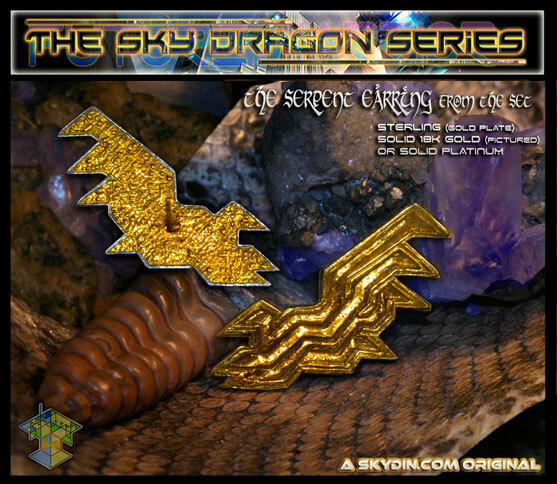 Or you can have Skydin Zeal channel purely for you! 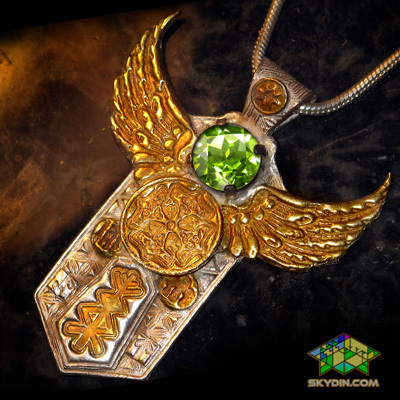 We will present to you a drawing by Skydin Zeal before he begins! 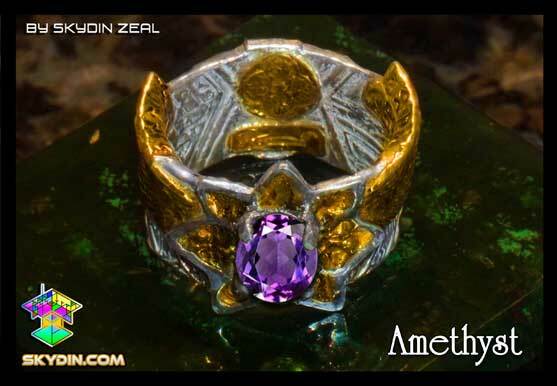 To initiate your Spiritually Customized Process simply add that to your cart at checkout! 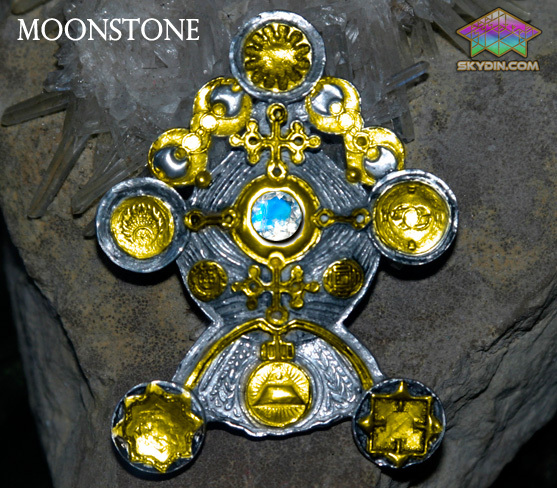 Among the 5 Aspect Empowering Pendants created in 2012 this pendant Integrates and Balances one's Spiritual Progress, Human Experience, New Psychic Gifts, Ying and Yang Balance, Rapid Increase in Synchronistic Events, Divine Guidance, Moral Clearing and maintaining one's Unique Spiritual Path. Gemstone Selection: Choose from (Pictured above Left to Right) Peridot, Mystic Topaz, Iolite, Pink Tourmaline, Ruby, Star Ruby, Sapphire, Emmerald, Swiss Topaz, Citrine, Aquamarine, Amethyst, Moldavite, Opal Triplet, Opal Solid, Lab Created Diamond, Natural Diamond, Spesartite Garnet (Red), Rhodolite Garnet (Magenta/Red) or Pearl. 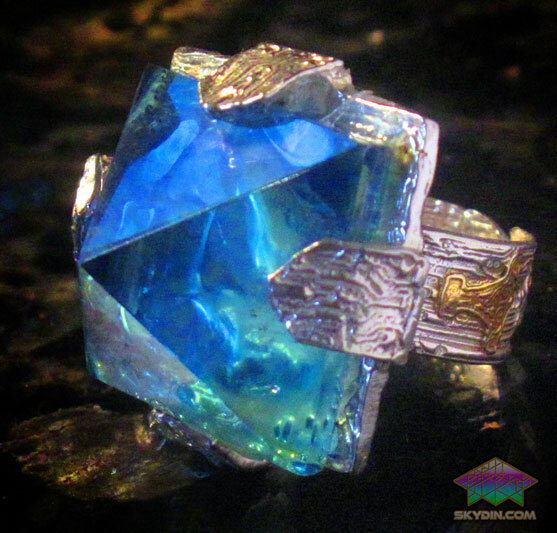 More information on the particular properties of gemstones can be found on the net, but often it's best to go with one's natural intuition. 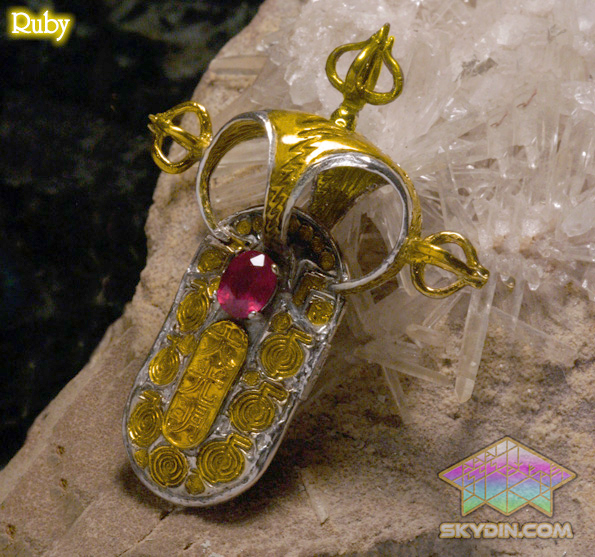 Technical Information: Size: 50mm x 23mm, Weight: 11.3 grams, Composition: .925 Sterling Silver with 18k gold accents. 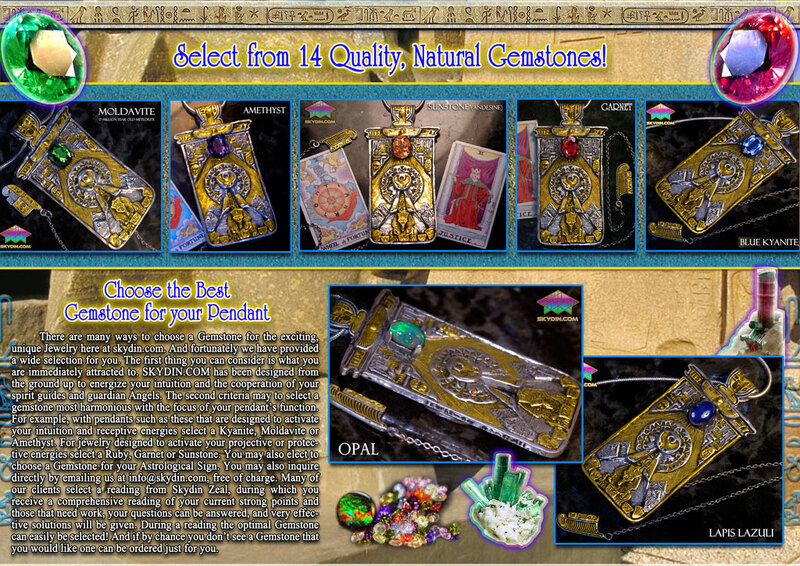 The actual piece you receivewill vary ever so slightly from our photographs. 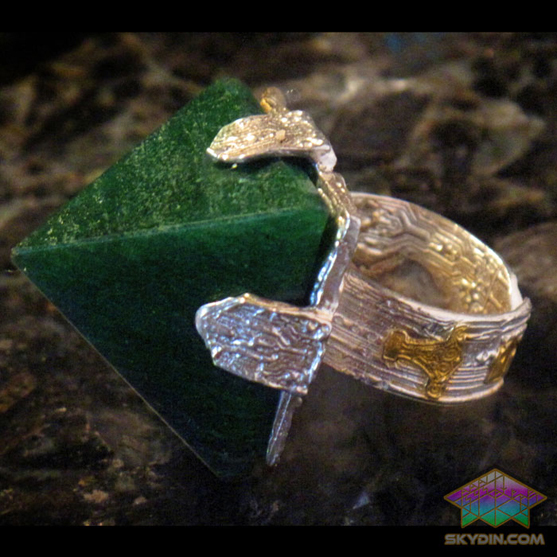 No Refunds offered on customized Jewelry, exchanges are available for everything else. 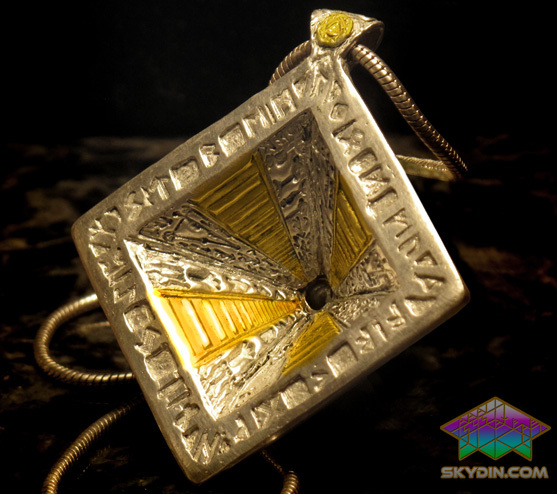 All Talisman Pendants and Rings created by Skydin Zeal are like living beings - they required genuine spiritual power, alot of careful thought, passion and months to be brought to life! 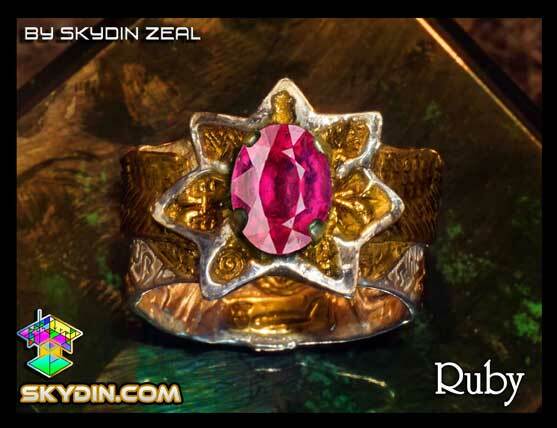 It is because of Skydin Zeal's rare talents that all of our products are Energetically Perfected, Beautiful, Powerful and Sacred! 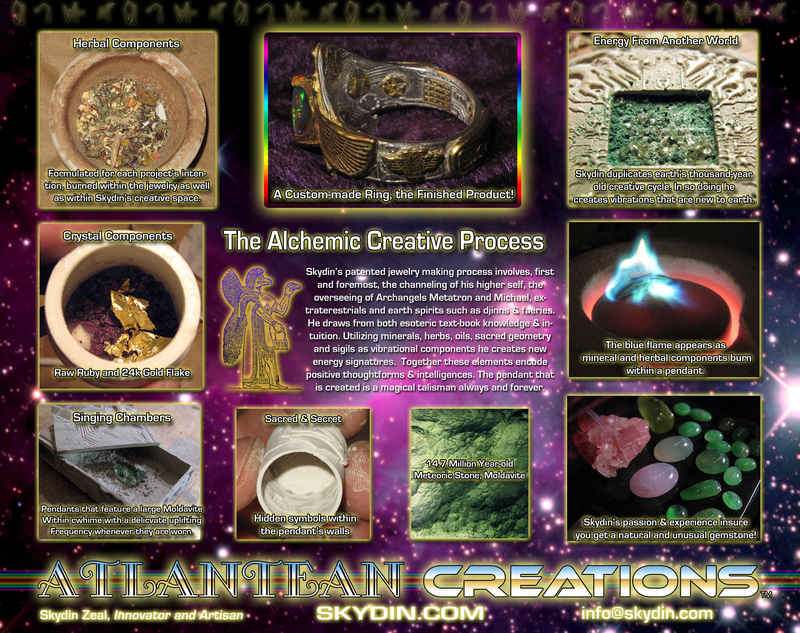 However, all that you see here you can customized exactly to your specifications, frequency and goals! This means a totally unique work of everlasting spiritual fashion and art just foryou! It involves a powerful psychic reading inwhich Skydin Zeal will read your chart with his incredible three-pronged method which includes the Scandinavian Runes, Ancient Egyptian Tarot and Numeology based on both Northern and Eastern systems! 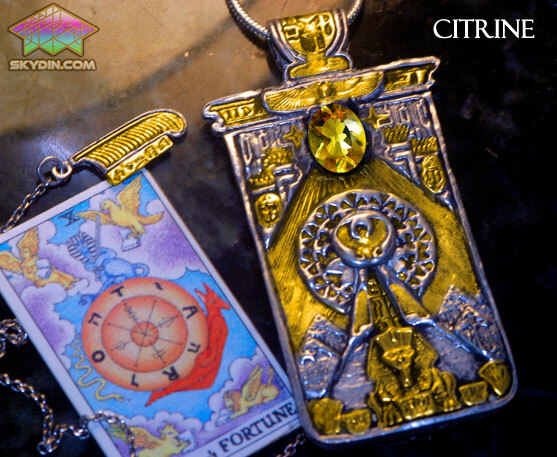 This leaves no room for error as he looks to help your spirit succeed from many points of view! 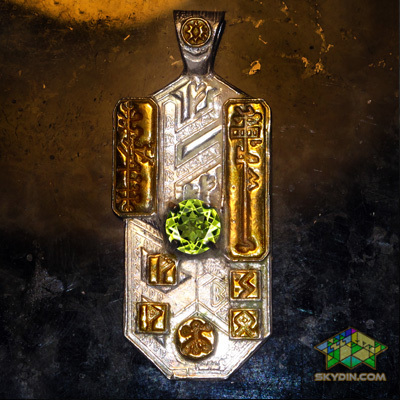 You then send a brief paragraph describing exactly what it is you would like to attain, and or what you would like to change. Several additional gemstones may be selected, the first additional gemstone is free as long as it has a skydin.com value of $14 or less. 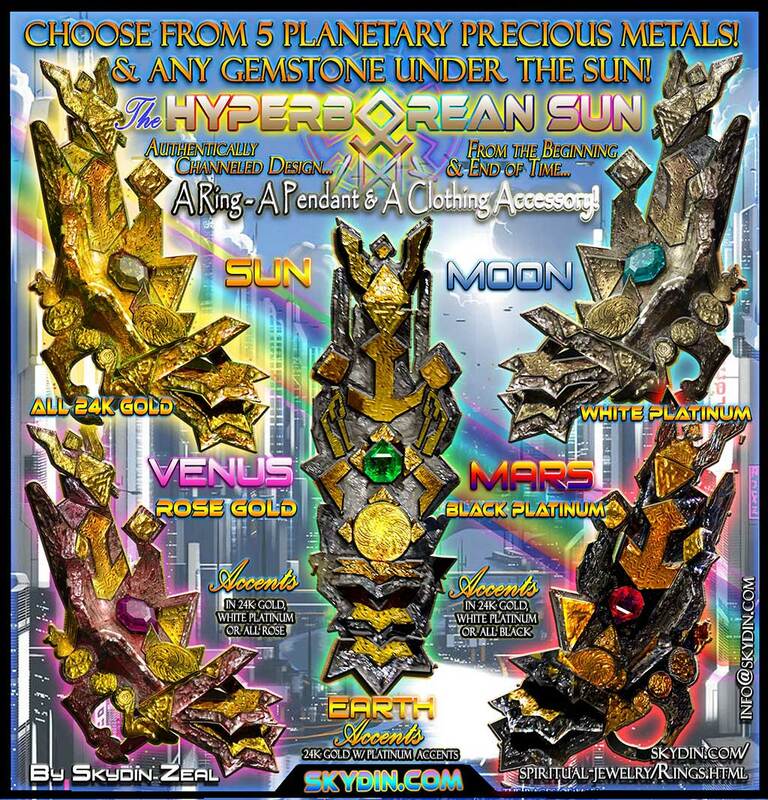 Please see the Archangel series secondary gemstones to view our below wholesale prices on more expensive gemstones! Skydin Zeal never profits from the gemstone you purchase, it is his desire to extend to you the cost that we actually pay on gemstones. 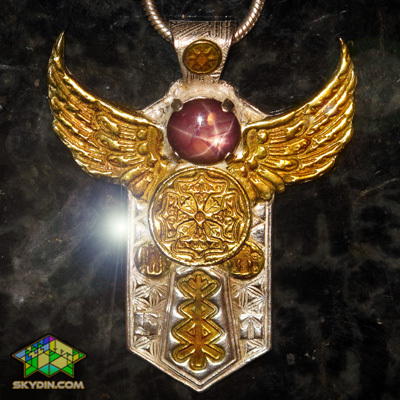 You can choose your own Symbols and designs from our 400+ Library of the most Powerful and Effective Symbols, which will then be individually made in fine silver and plated in 24k Gold. 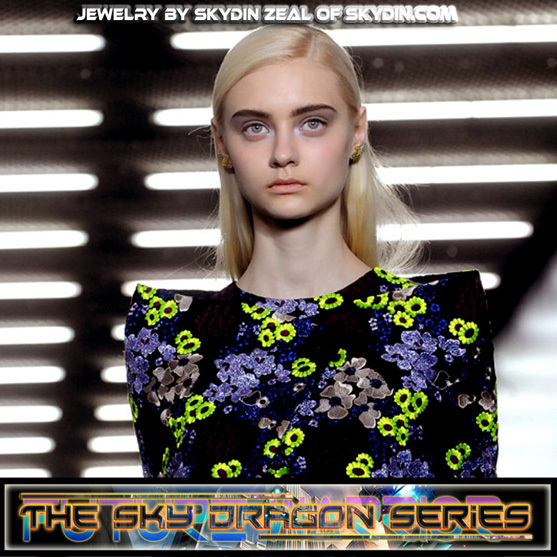 Or you can have Skydin Zeal channel purely for you! 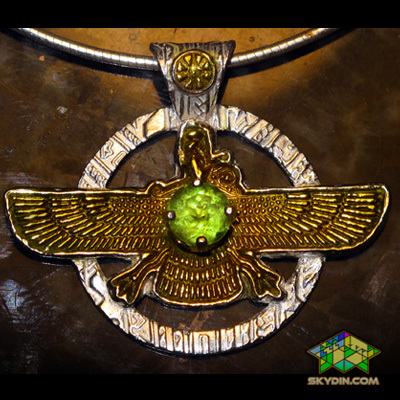 We will present to you a drawing by Skydin Zeal before he begins! 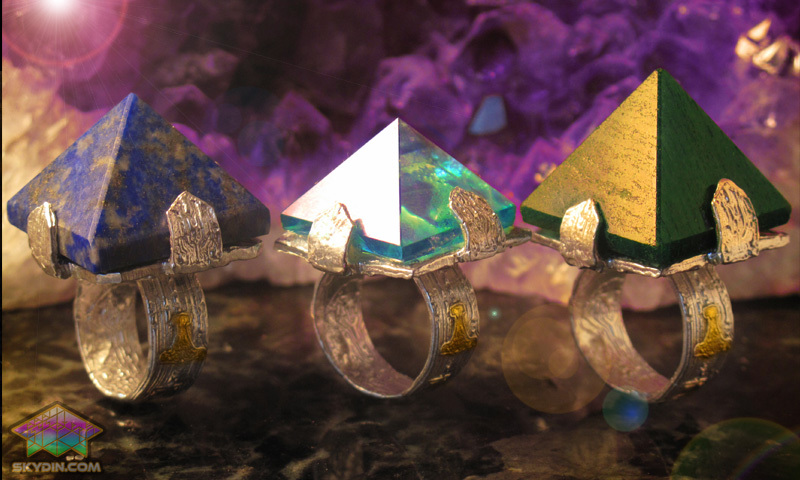 To initiate your Spiritually Customized Process simply add that to your cart at checkout! 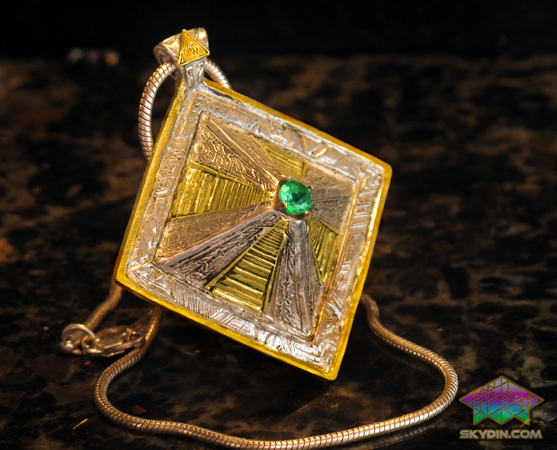 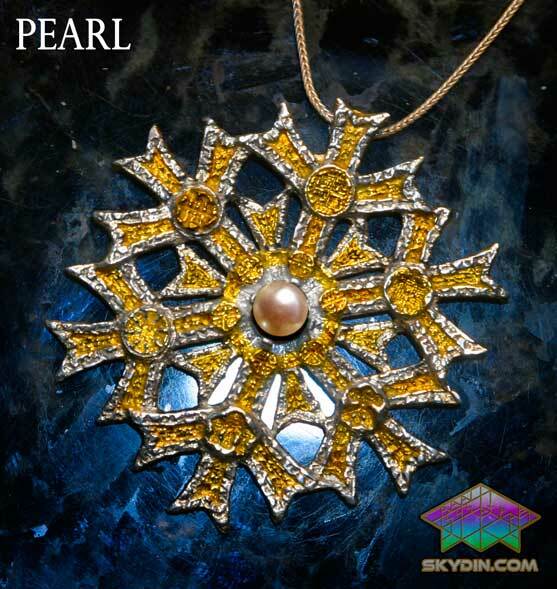 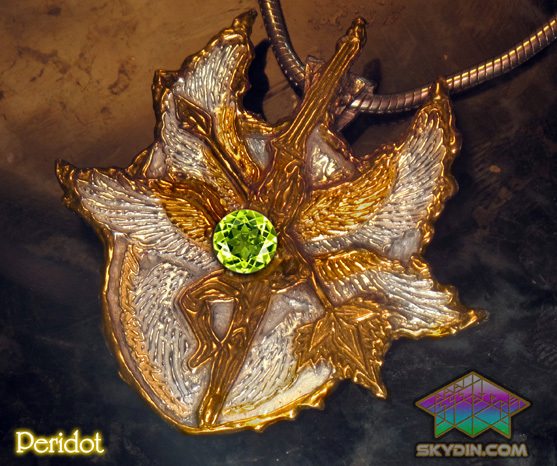 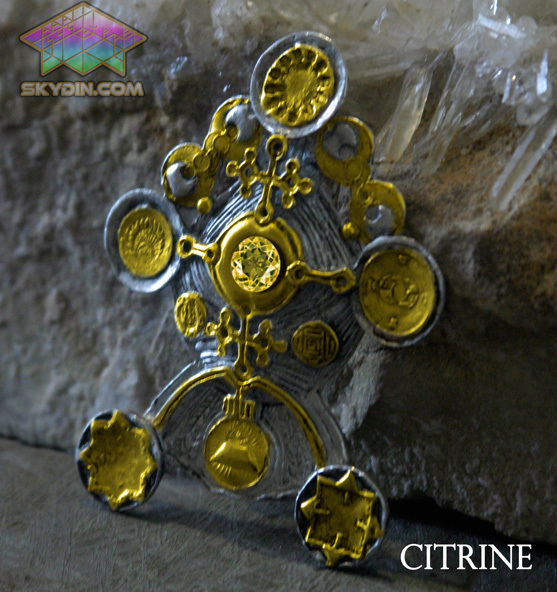 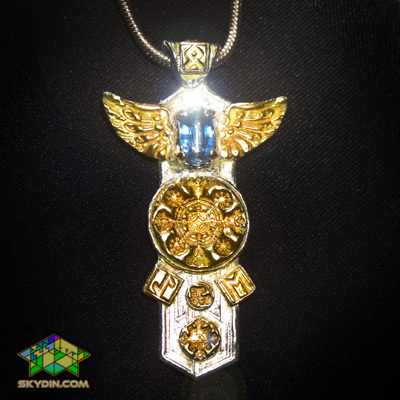 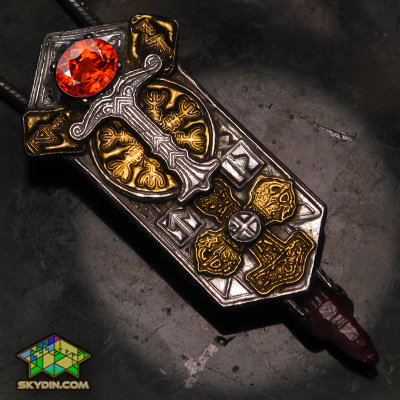 The most Defense/Offense Orientated Pendant Skydin Zeal has ever created! 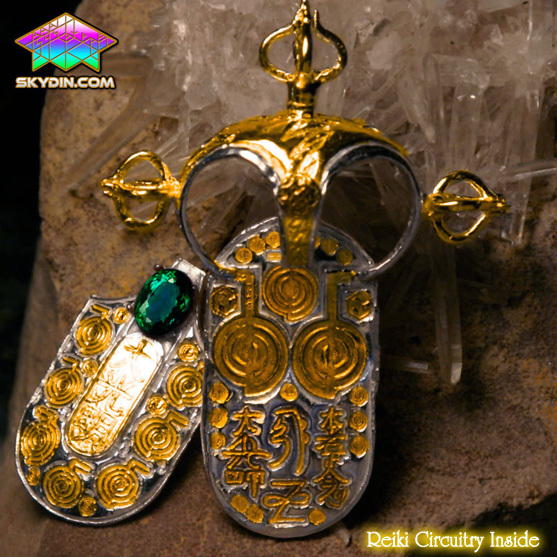 Often this pendant has been termed The Martial Artist's Pendant, or The Warrior's Pendant. 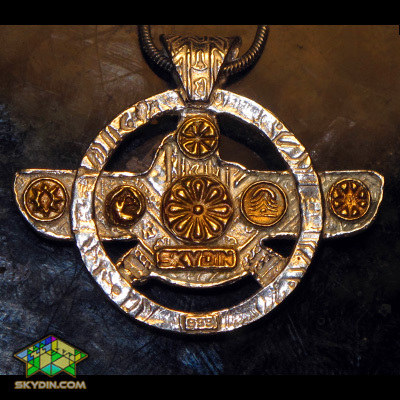 This pendant holds the energetic power of 19+ Talismans, Ancient Symbols each intended to increase one's Self Defense, both Physical and Spiritual, Emotional and Psychic. 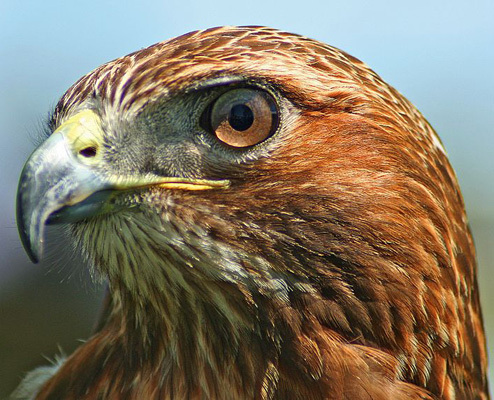 It’s important to note that the energetic intelligence, or messenger of any and all bad experiences can actually be frightened. 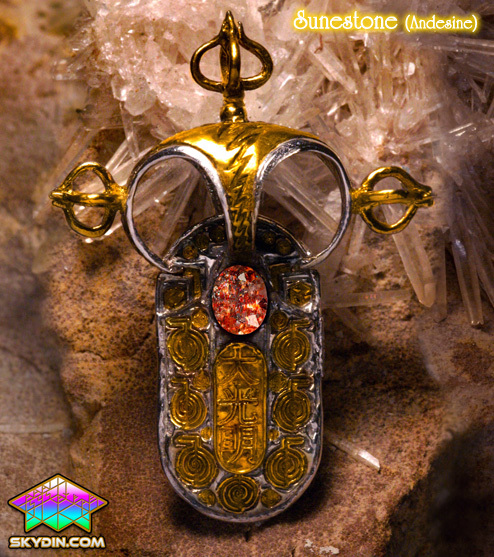 This is why in feng shui mirrors work to keep bad experiences away, this is also why loud noises function similarly. Each of this pendant’s 19+ symbols have the power to do that! 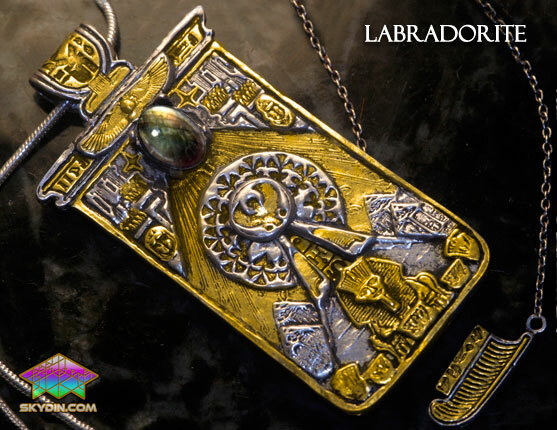 Sometimes negativity can come from another person in our lives, this Pendant has several ancient symbols created to neutralize or deflect an opponent’s negative energy back on to them. 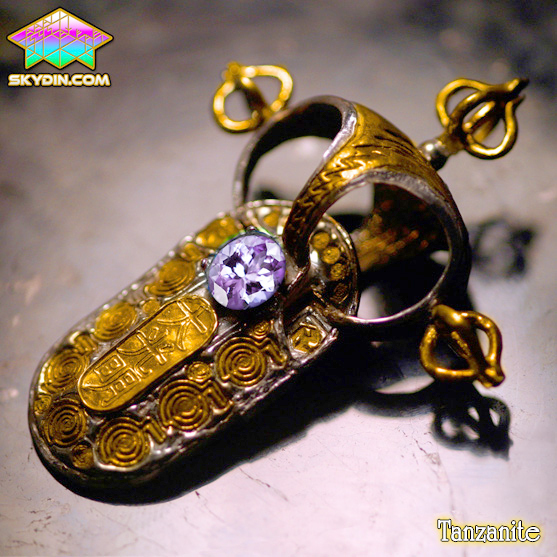 This Pendant also increases one's Physical and Emotional Endurance, Tenacity and Technical Talents. 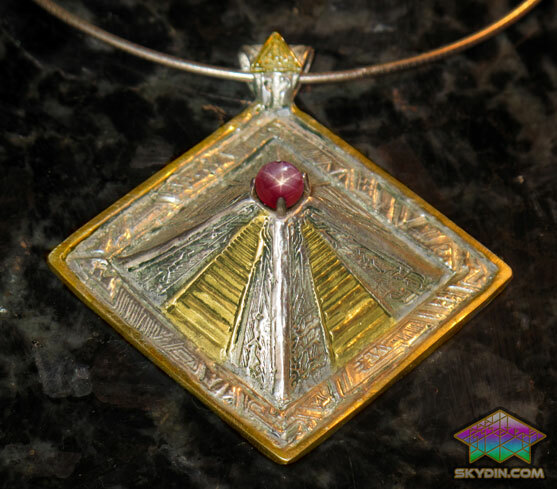 One may even find that one needs less sleep as this Pendant increases all Active aspects of the wearer's life. 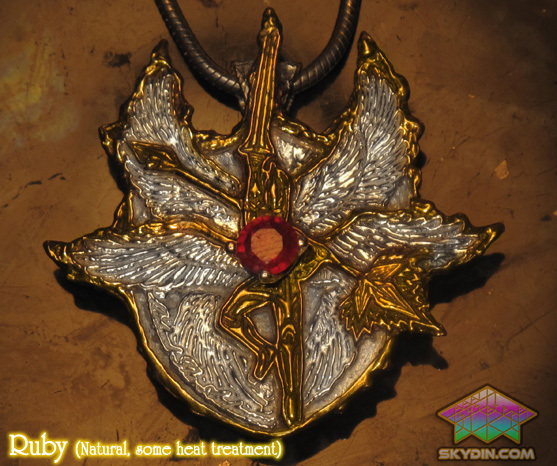 Also expect that one's Immune System to be improved as well. 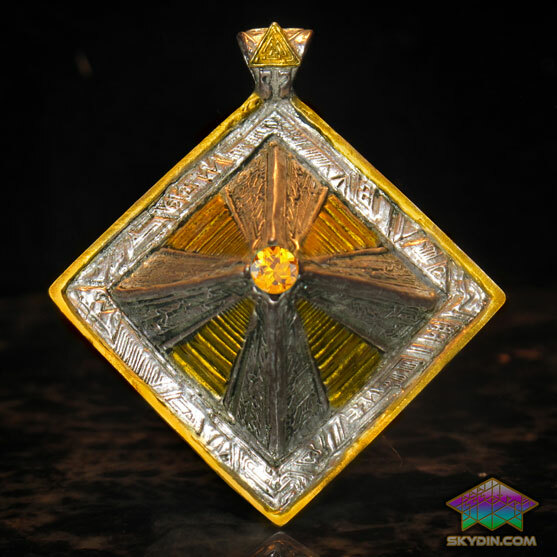 This Powerful Pendant also confers a sense of Just and Honorable Behavior. 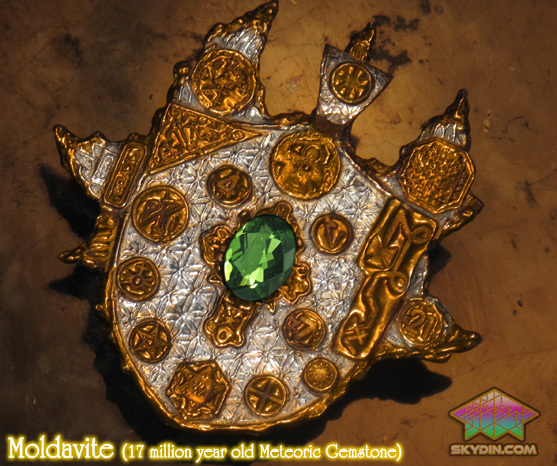 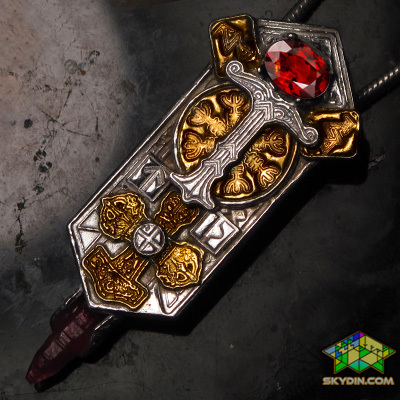 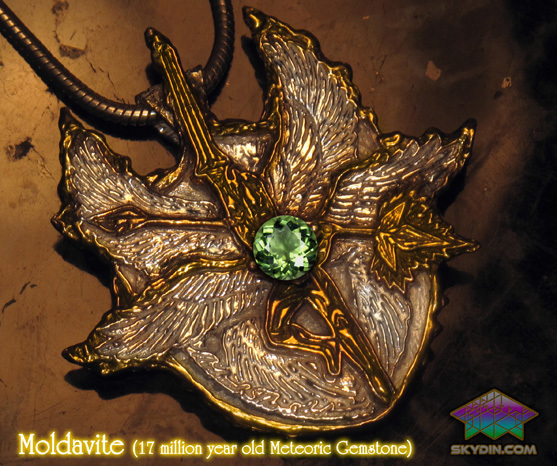 The pendant also increases one's chances at Victory in Contests Involving Random Drawings and Judging. 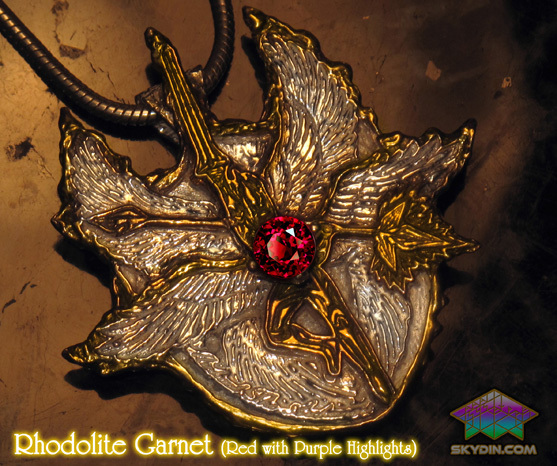 Gemstone Selection: Choose from (Pictured above Left to Right) Rhodolite Garnet (Deep Magenta/Red), Moldavite (17 Million Year old Meteorite), Spessartine Garnet (Warm Red), Ruby, Star Ruby, All 100% Natural and Authentic! 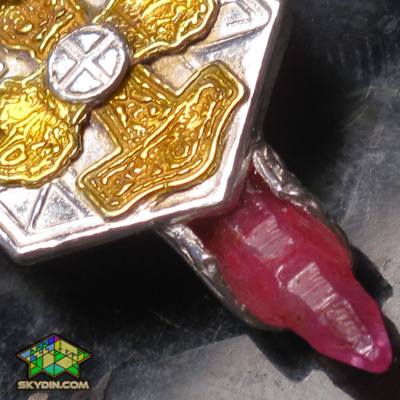 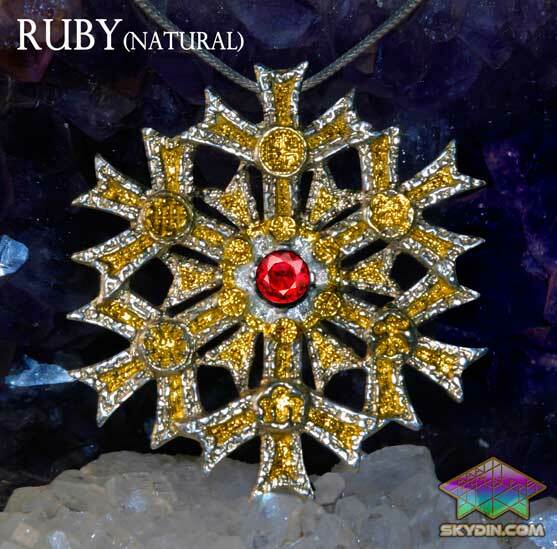 The Pendant also includes a Natural Ruby Crystal Point to further Amplify and Actualize this Pendant's Fiery Symbols. 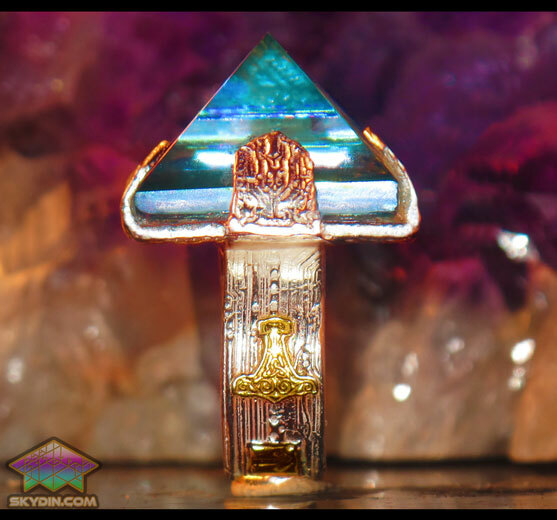 These gemstones have been selected to Increase all of the intentions the 19+ Symbols Generate. 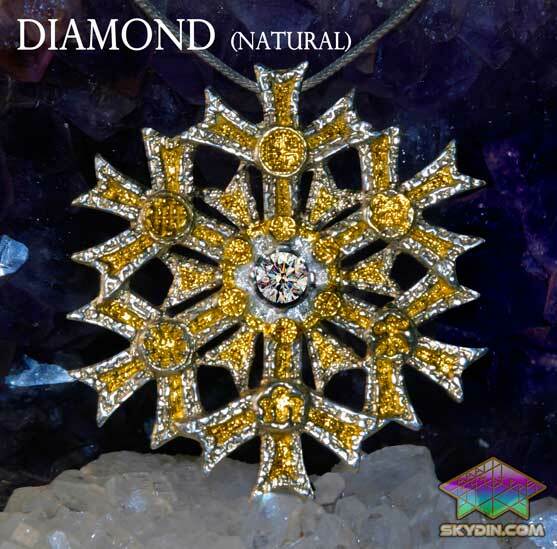 More information on the particular properties of gemstones can be found on the net, but often it's best to go with one's natural intuition. 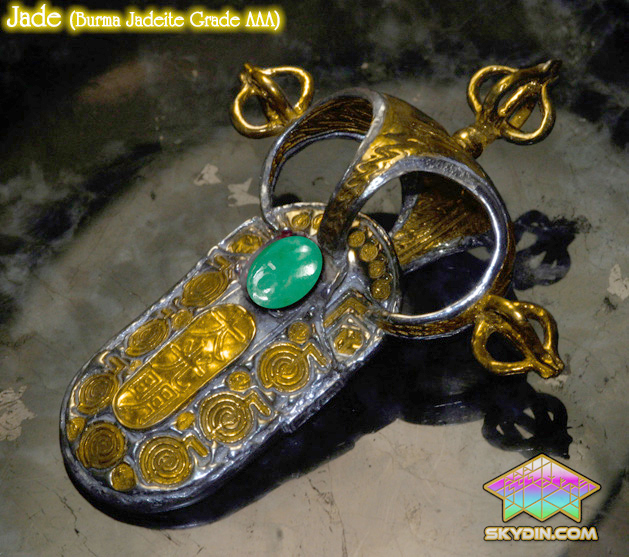 Technical Information: Size: 53mm x 25mm x 11mm, Weight: 12.8 grams, Composition: .925 Sterling Silver with 18k gold accents. 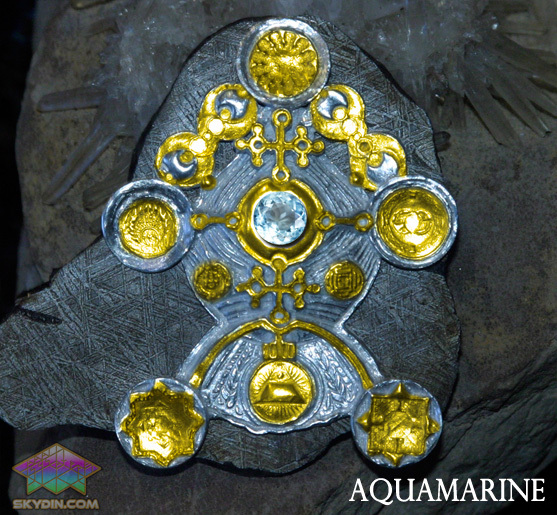 Every Pendant is uniquely made! 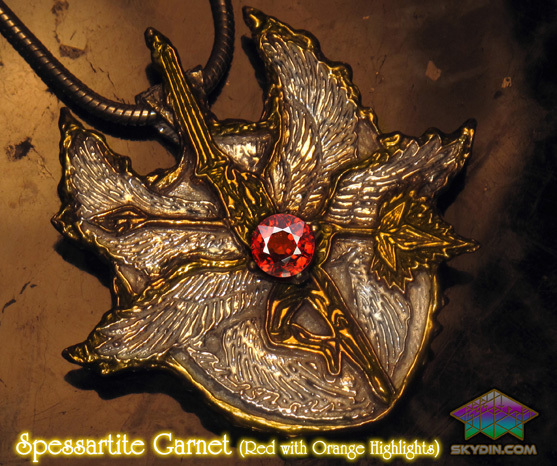 The actual piece you receivewill vary ever so slightly from our photographs. 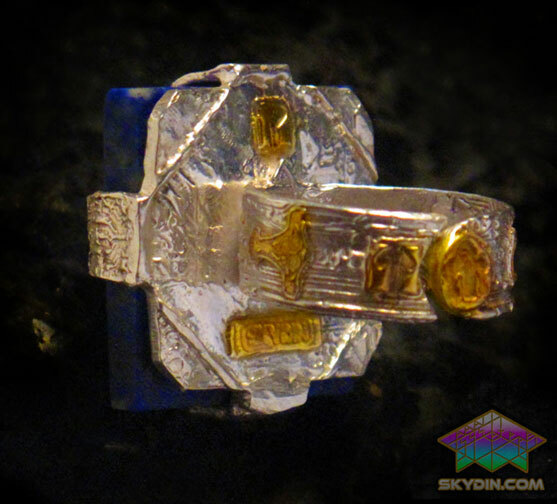 No Refunds offered on customized Jewelry, exchanges are available for everything else. All Talisman Pendants and Rings created by Skydin Zeal are like living beings - they required genuine spiritual power, alot of careful thought, passion and months to be brought to life! 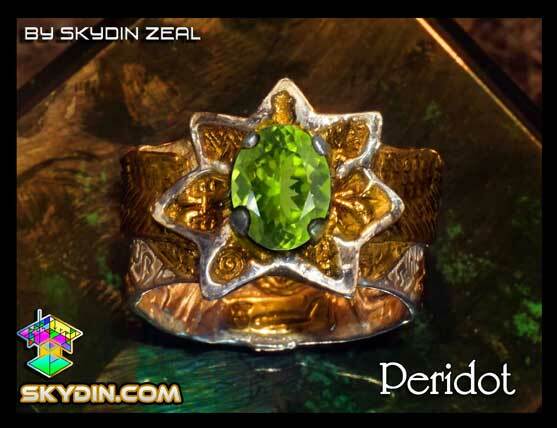 It is because of Skydin Zeal's rare talents that all of our products are Energetically Perfected, Beautiful, Powerful and Sacred! 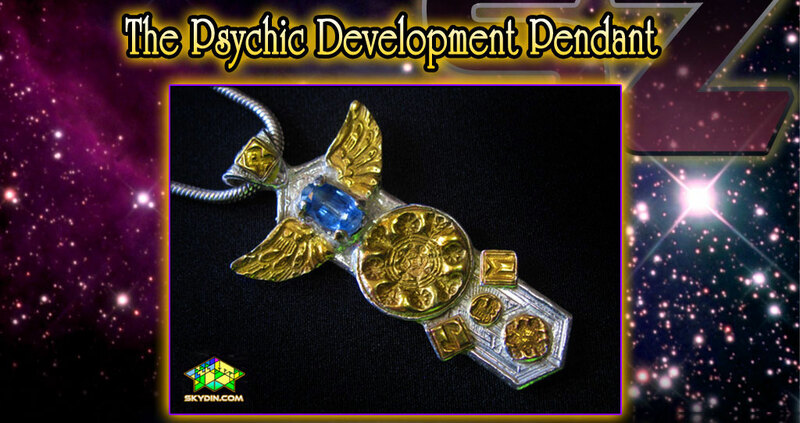 However, all that you see here you can customized exactly to your specifications, frequency and goals! 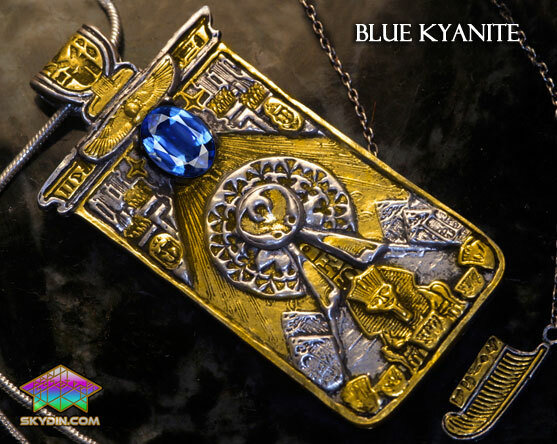 This means a totally unique work of everlasting spiritual fashion and art just foryou! 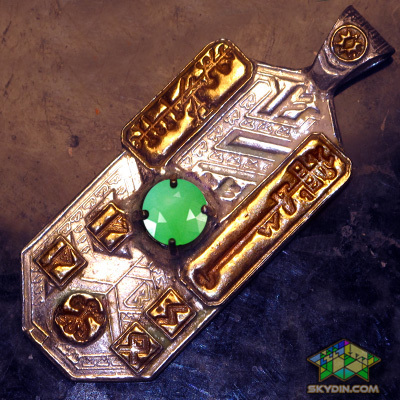 It involves a powerful psychic reading inwhich Skydin Zeal will read your chart with his incredible three-pronged method which includes the Scandinavian Runes, Ancient Egyptian Tarot and Numeology based on both Northern and Eastern systems! This leaves no room for error as he looks to help your spirit succeed from many points of view! 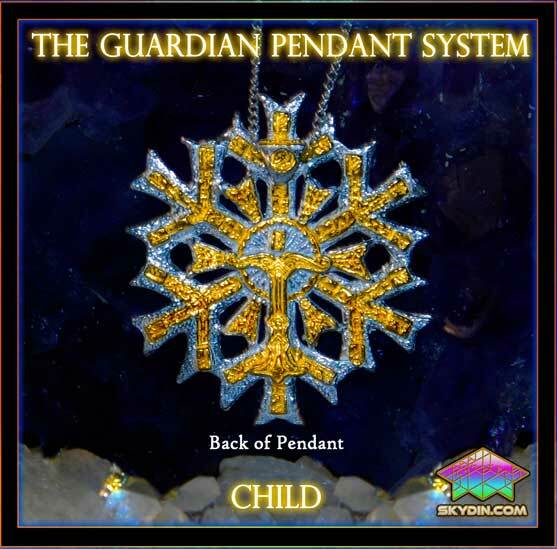 You then send a brief paragraph describing exactly what it is you would like to attain, and or what you would like to change. 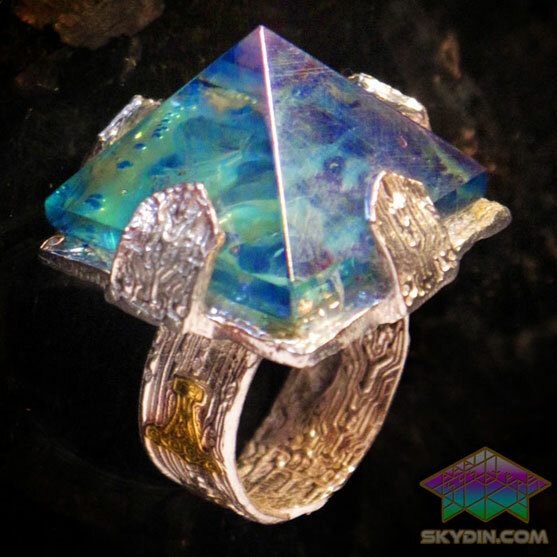 Several additional gemstones may be selected, the first additional gemstone is free as long as it has a skydin.com value of $14 or less. 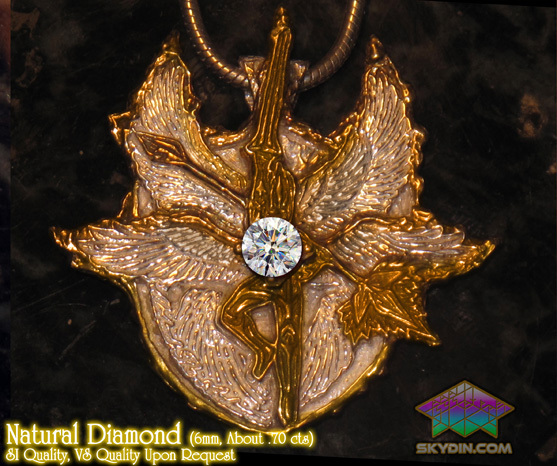 Please see the Archangel series secondary gemstones to view our below wholesale prices on more expensive gemstones! 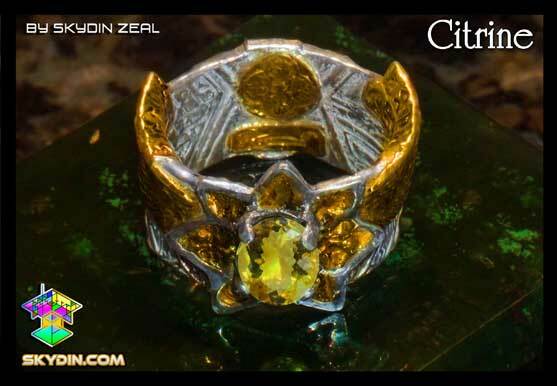 Skydin Zeal never profits from the gemstone you purchase, it is his desire to extend to you the cost that we actually pay on gemstones. 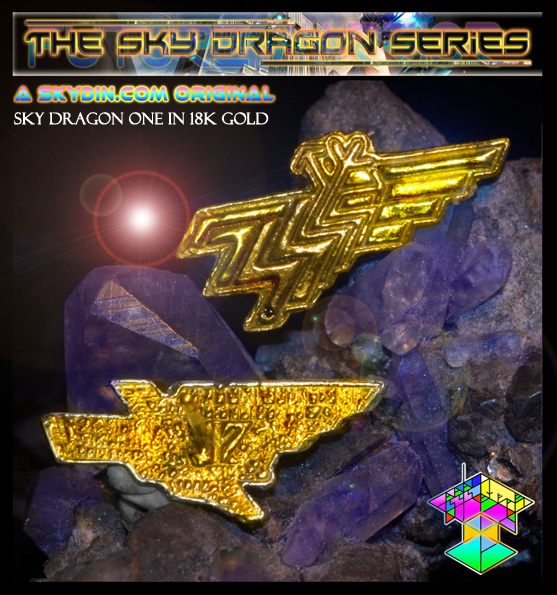 You can choose your own Symbols and designs from our 400+ Library of the most Powerful and Effective Symbols, which will then be individually made in fine silver and plated in 24k Gold. 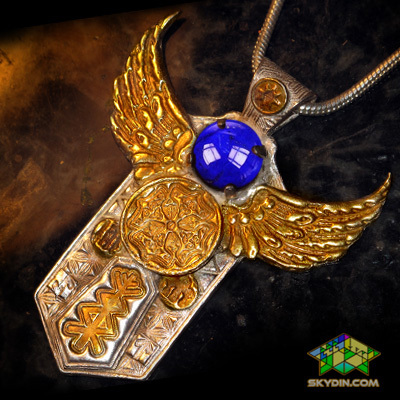 Or you can have Skydin Zeal channel purely for you! 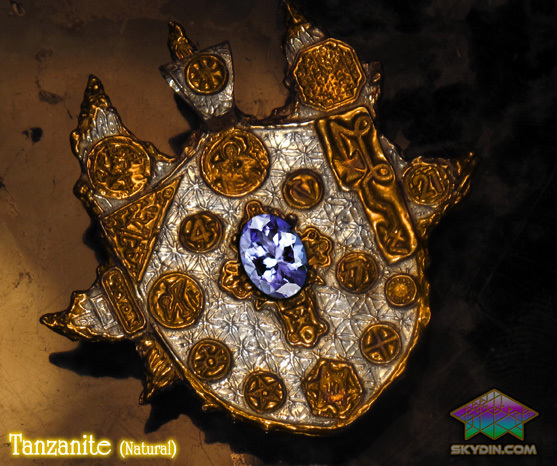 We will present to you a drawing by Skydin Zeal before he begins! To initiate your Spiritually Customized Process simply add it to your cart before checkout and Skydin Zeal will be in contact with you within 24 hours! The Angelic Shield Pendant was designed for Protection and Self Defense, and unlike the Warrior's Pendant it focuses it's protective energy purely on defense and healing energies. 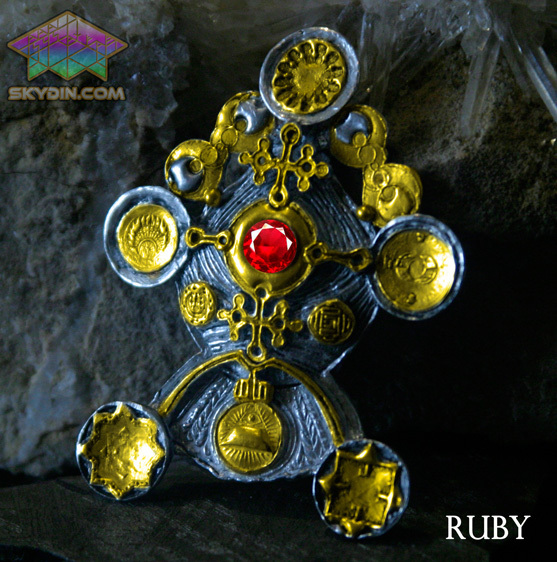 There is nothing overly fiery, aggressive or too energetic about this pendant - although it can and will add more energy to your step. This pendant confers the protection and communion of the Angels and Archangels. 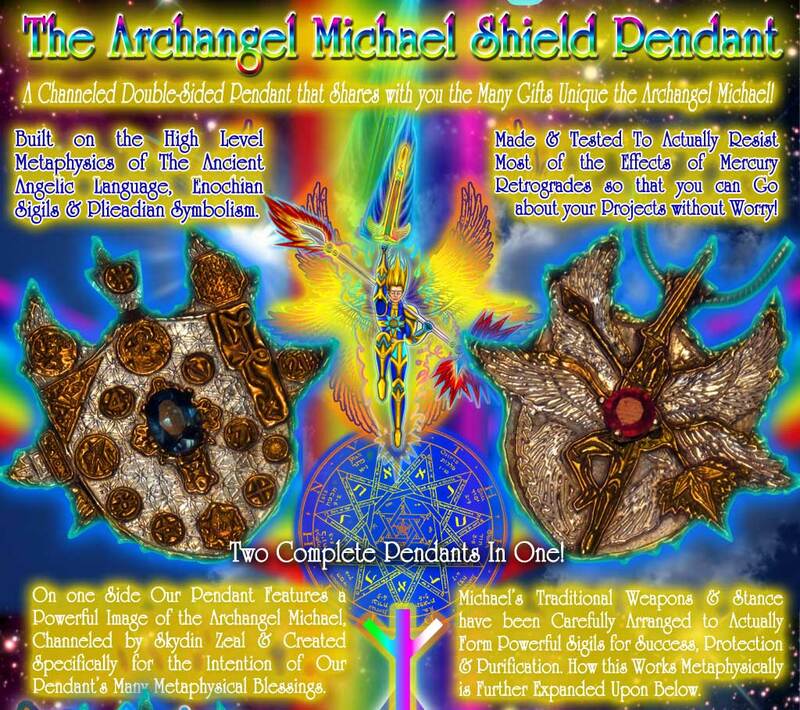 It's important to note that the Angels and Archangels are not exclusive to any one religion. 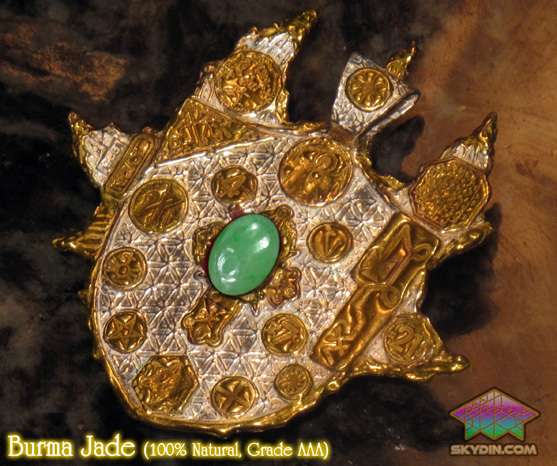 They are much like the Avatars and Bodhisattvas who are here to help us. 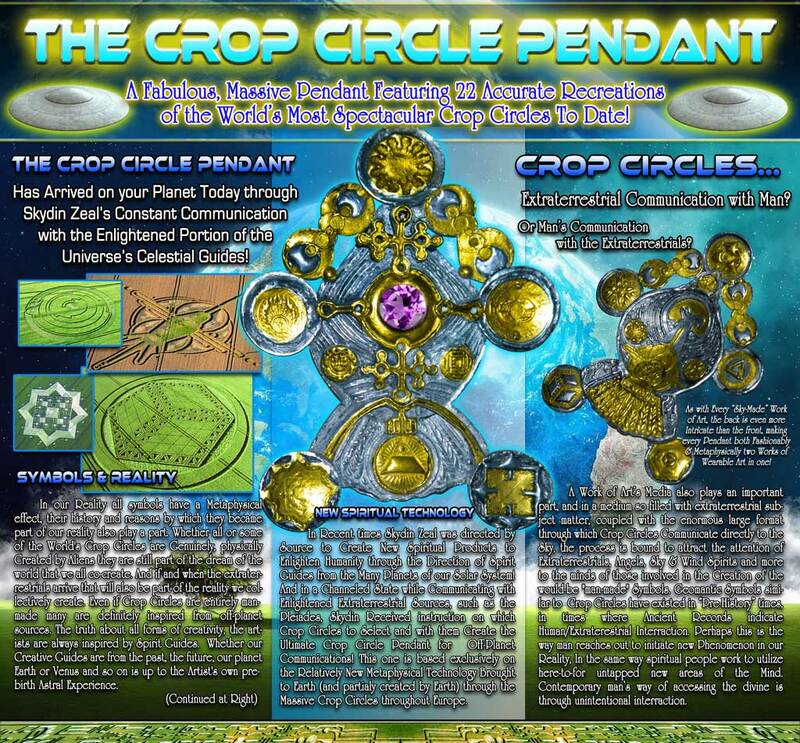 They can even blend with your higher self... 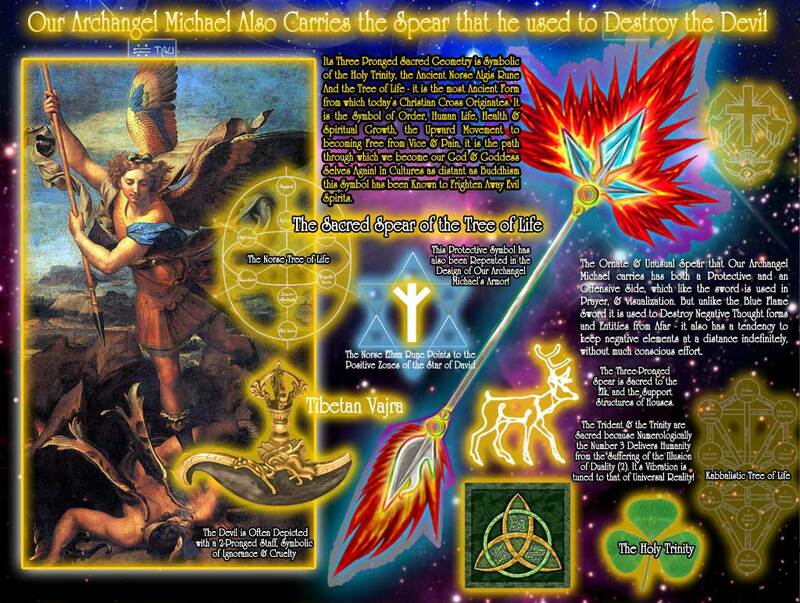 The protection of the Angels comes to us, apparently, from outside of us. If it's channeling and other forms of communication with Archangels that you are looking for this pendant can make the impossible possible, and it is not specific to any one Angel, so it's much like a gateway. 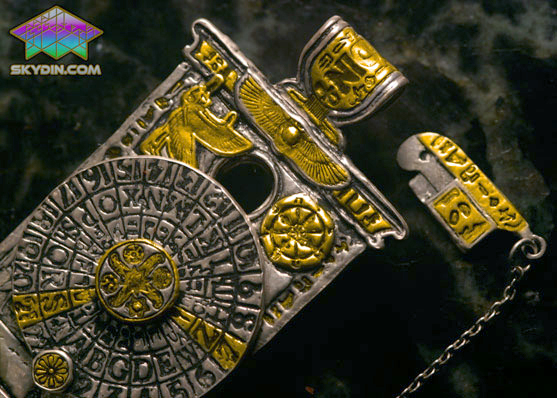 As for it's Protective qualities, it uses the aid of ancient Sigils, Enochian (Angelic) Kabbalistic and Icelandic/Runic. 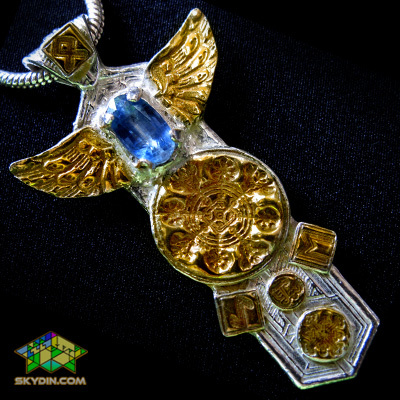 It's important to note that the Angels had a presence in all of the Ancient world, with many races and tribes, including those of Ancient Scandinavia. 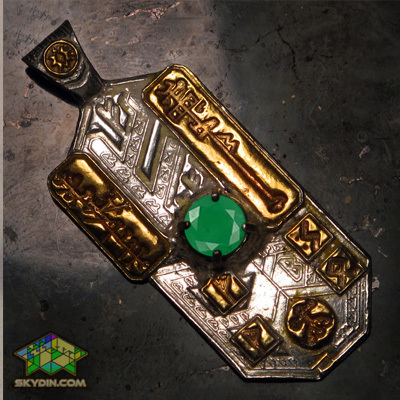 Psychic Self Defense is important as everyone around you is constantly practicing magic, unaware of the fact! 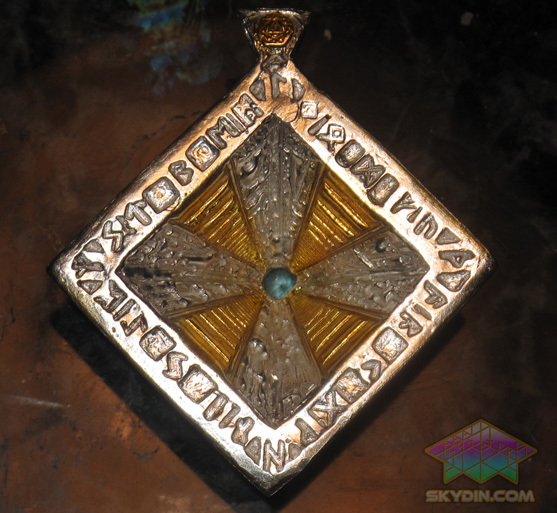 This pendant has two symbols on the front to protect you from both conscious and unconscious "witchcraft". 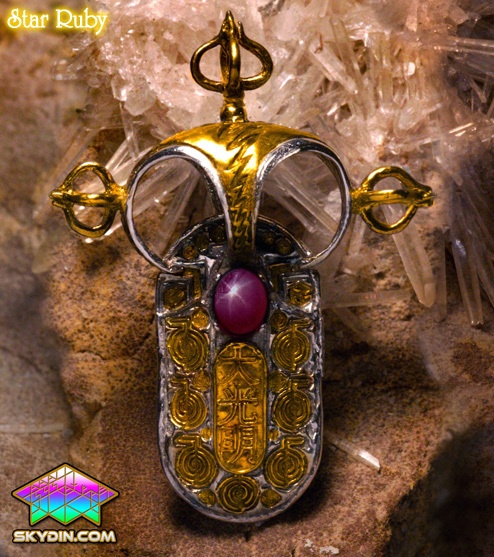 This pendant covers much of what the Warrior Pendant covers, but again, without Activating aggressive energies and without harming those who have tried to psychically attack you, consciously or unconsciously, though if their attack is particularly malicious it may after missing it's target find it's way back on to them. 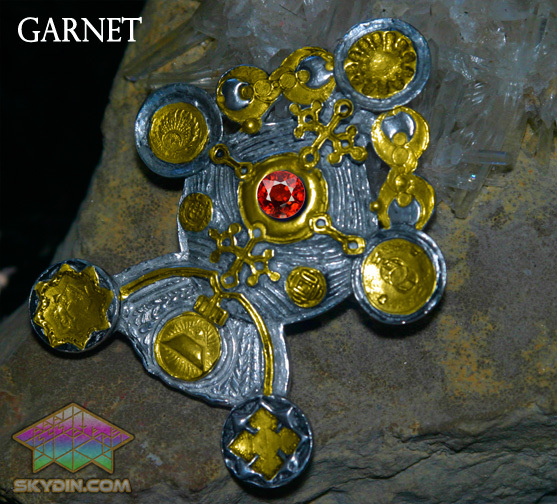 This pendant will, like the Warrior's Pendant, protect you and guide you away from physical accidents. It should also protect your constitution and immune system, by subliminally encouraging you to eat better food, take in vitamins, etc. 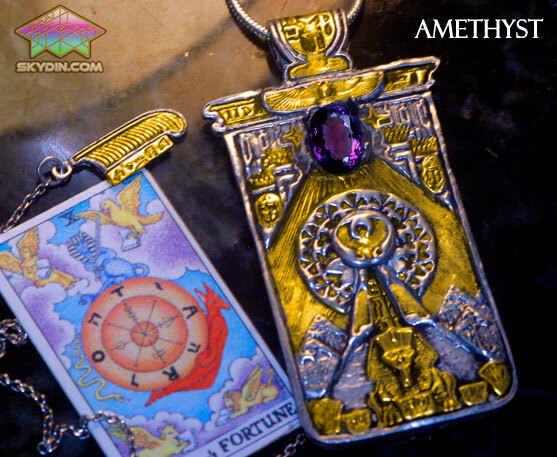 Of course your decisions to take better care of yourself will always appear as just random hunches. 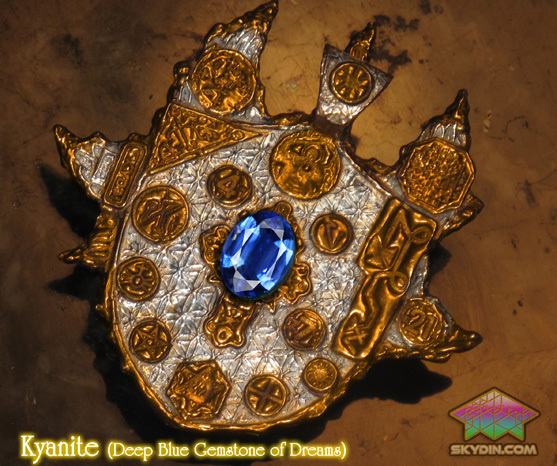 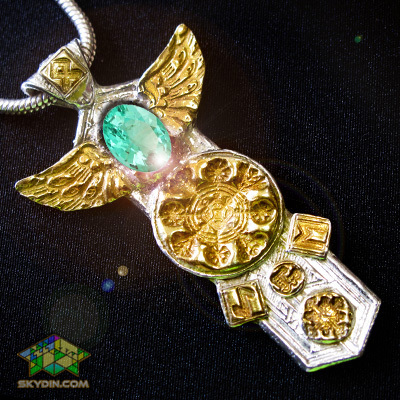 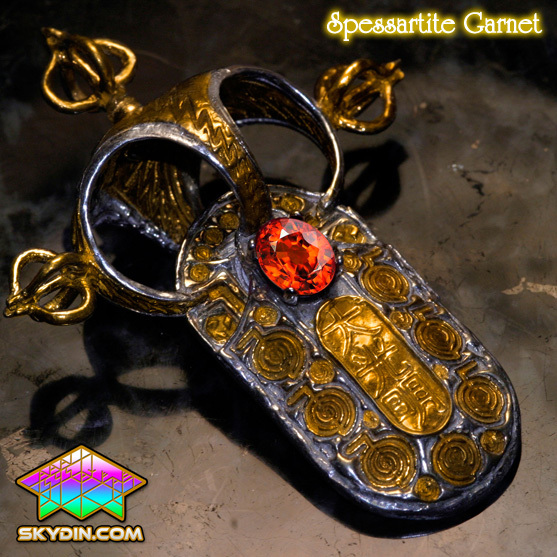 Gemstone Selection: The Angelic Shield Pendant includes the selection of 9 Gemstones. 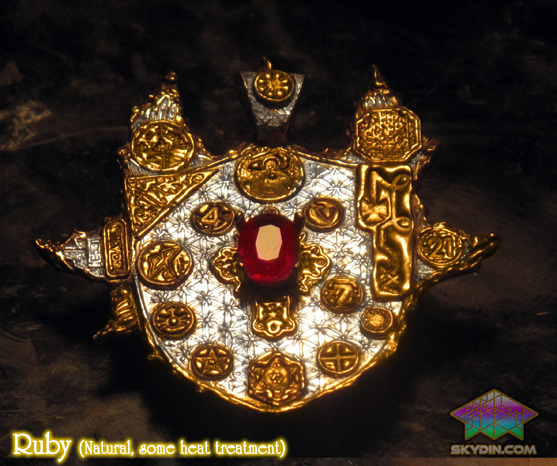 They have been acquired through positive and natural means. The best and most powerful way to select a stone is very simple, what are you drawn to, instinctively, visually or by the gemstone's name? 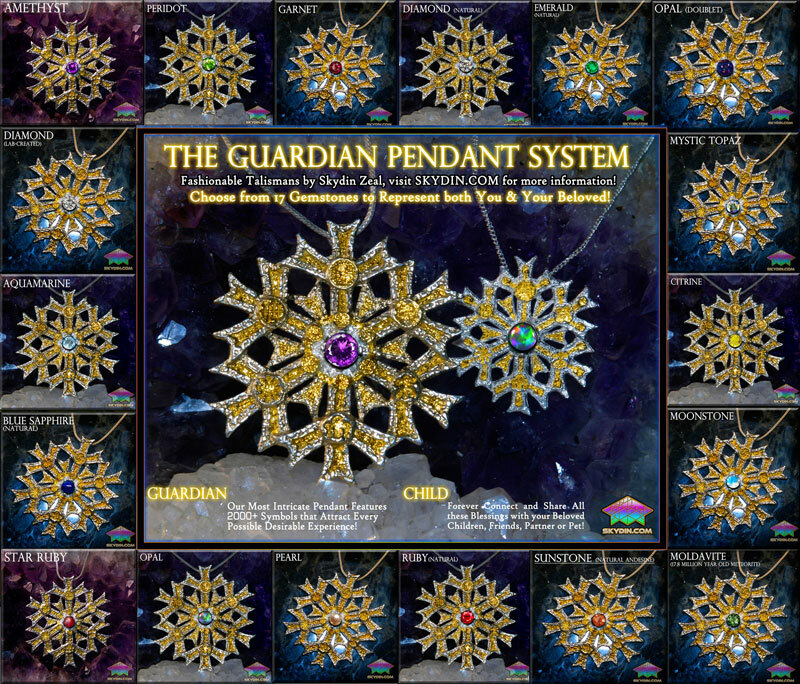 Some say select a gemstone for it's Zodiac Affinity, remember each sign has more than one gemstone association, and often color similarity can be a valid attribute. 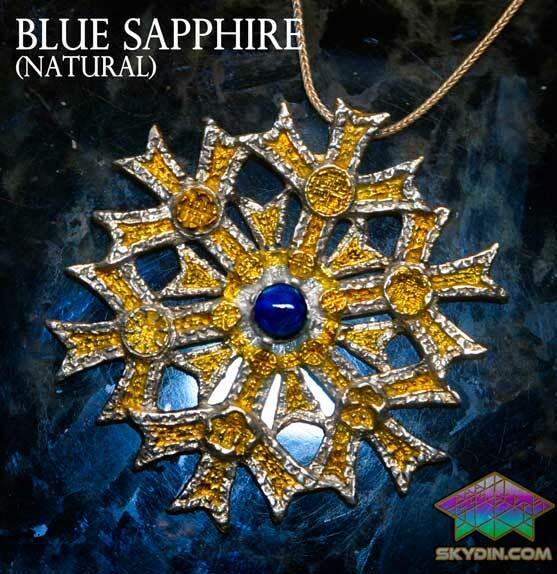 If it's Purely Protective vibrations that you seek select either Lapis Lazuli, Ruby, Star Ruby or Garnet. 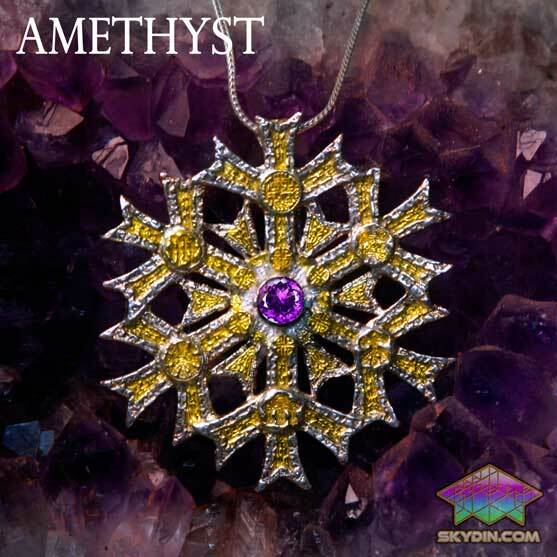 If it's Connection to the Divine, select Amethyst, Rose Quartz or Labradorite. 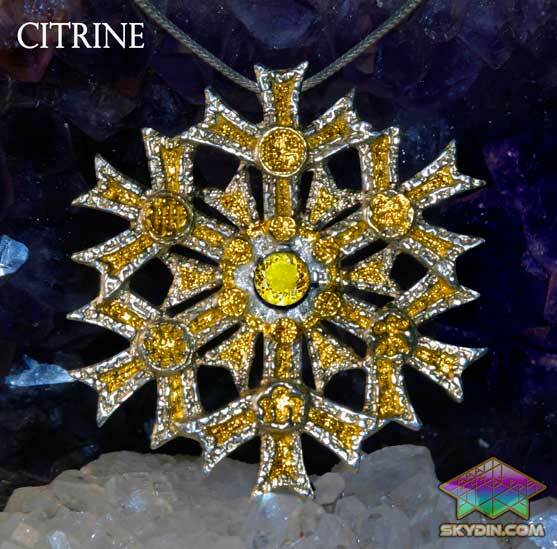 For Confidence & Emotional Well-being select Citrine, Garnet, Ruby, Star Ruby Lapis or Peridot. 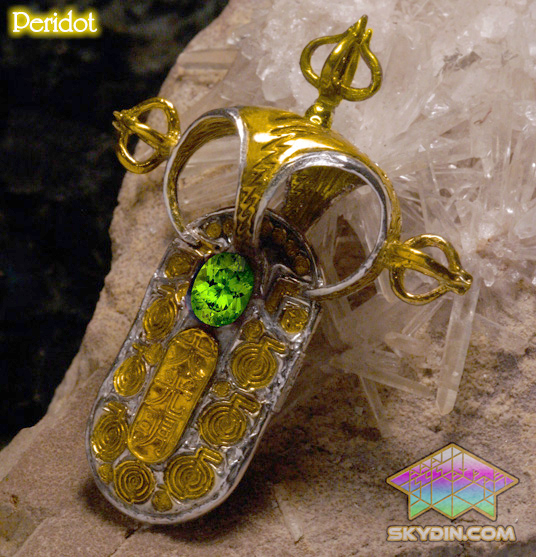 For Prosperity select Peridot, Citrine or Lapis Lazuli. 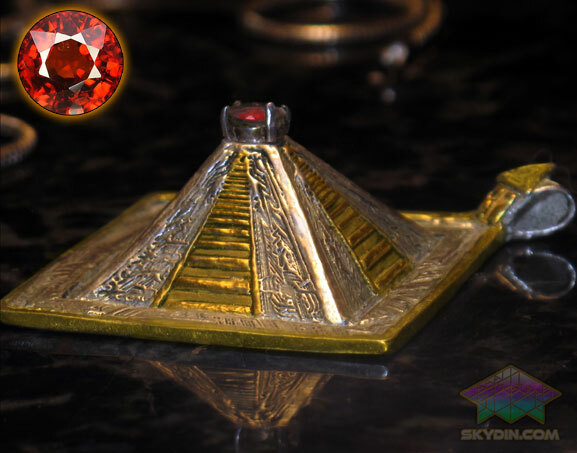 All gemstones are at true wholesale price, the retail value of some of these gemstones is several hundred dollars, but we at Skydin.com make our money on our unique gift to the world not simply marking materials up. 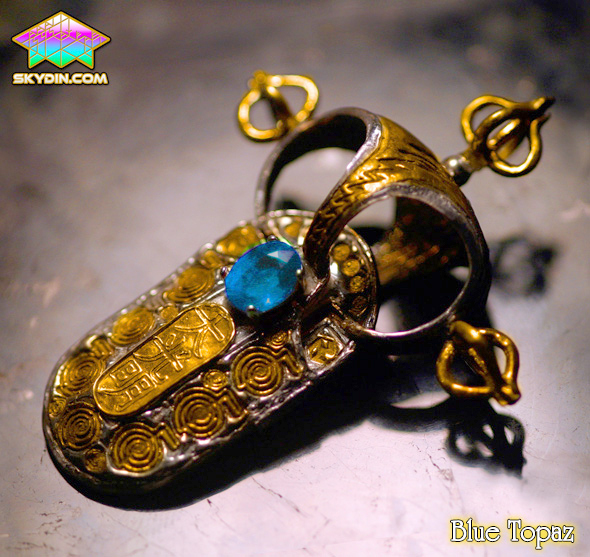 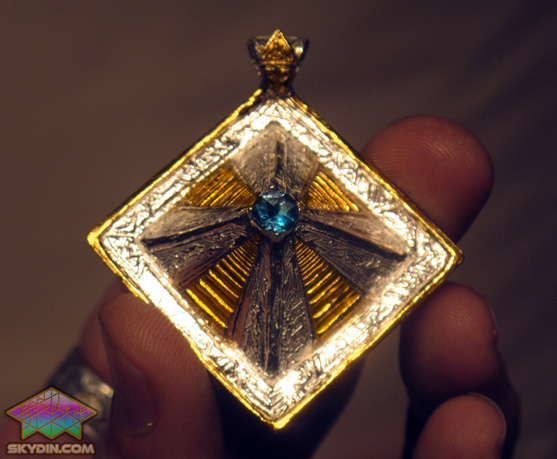 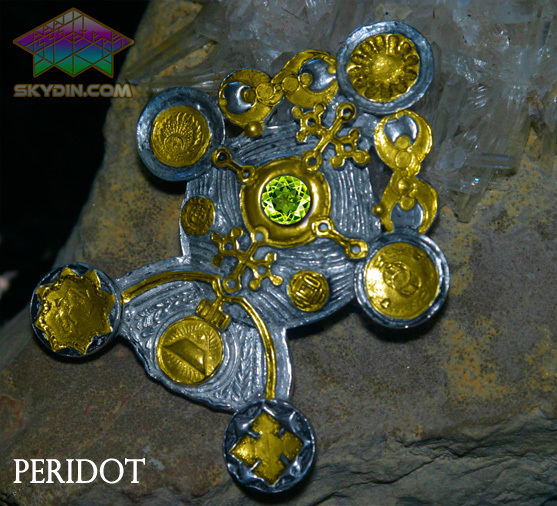 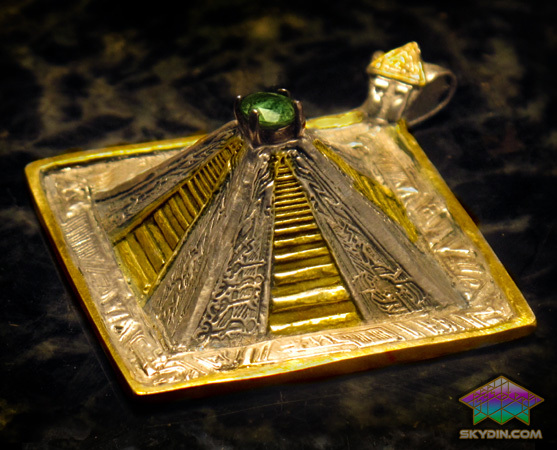 Technical Information: This Pendant is .925 Sterling Silver with 18k gold accents and weighs a solid 21 grams. 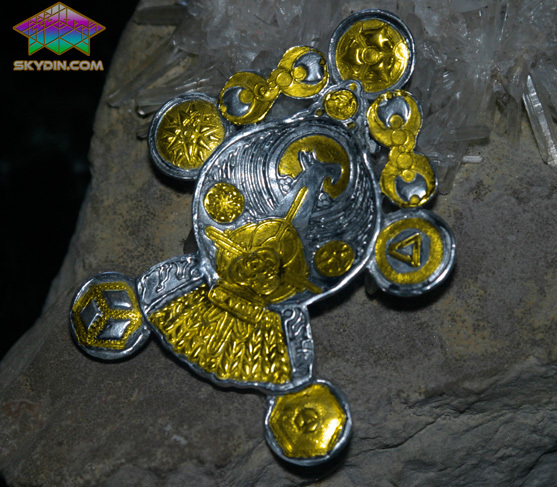 Size: 57mm x 47mm x 11mm, Weight: 21 grams. 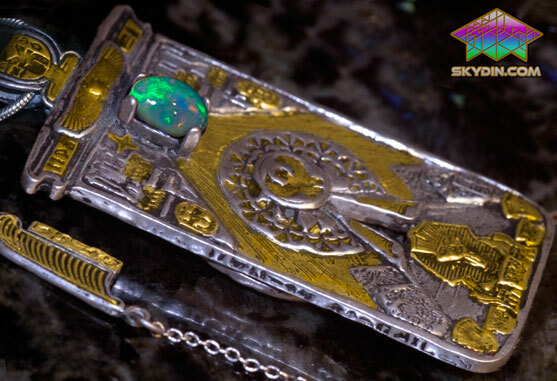 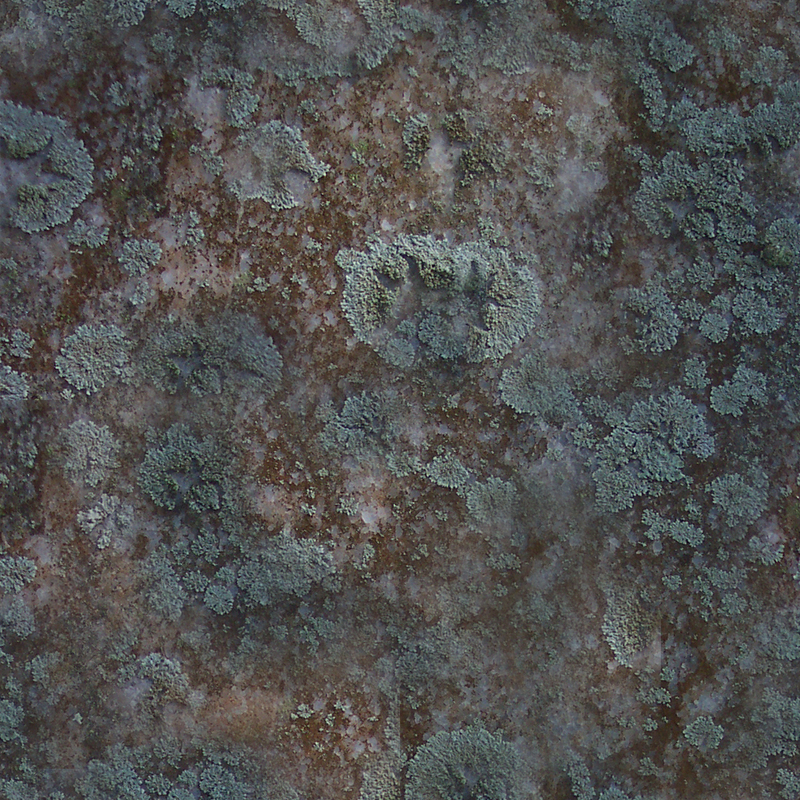 The actual piece you receive will vary ever so slightly from our photographs. 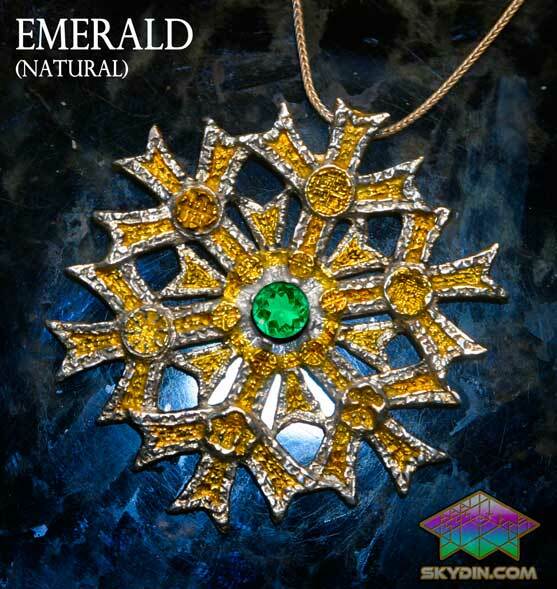 No Refunds offered on customized Jewelry, exchanges are available for everything else. All Talisman Pendants and Rings created by Skydin Zeal are like living beings - they required genuine spiritual power, alot of careful thought, passion and months to be brought to life! 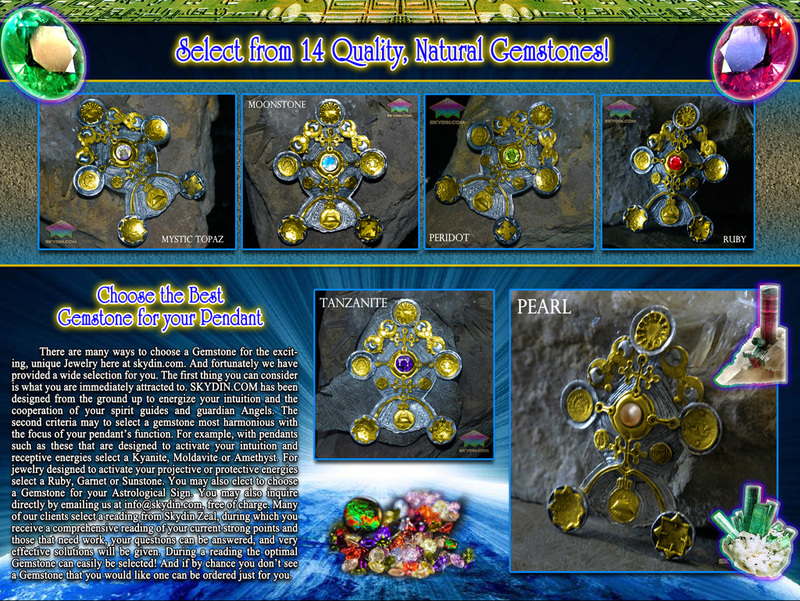 All of our products thusly are complete, energetically perfected, beautiful and holy! 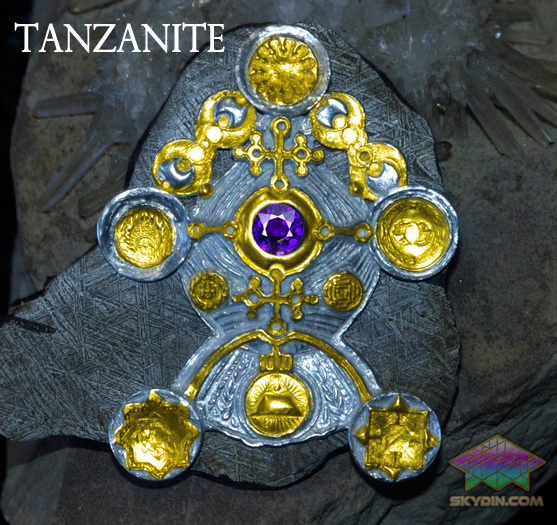 However all that you see here you can customized exactly to your specifications, frequency and goals! 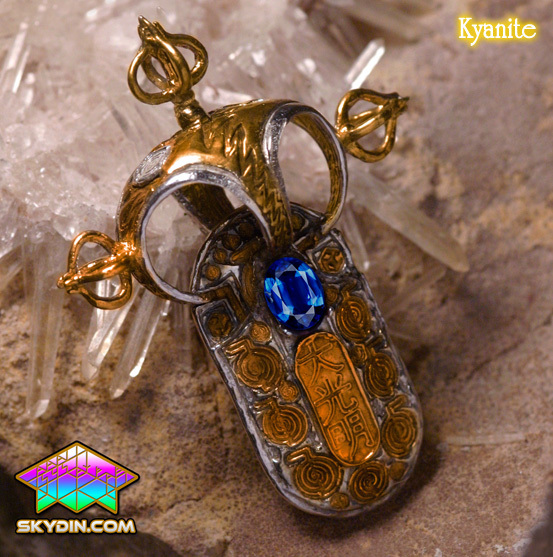 This means a totally unique work of everlasting spiritual fashion and art just foryou! 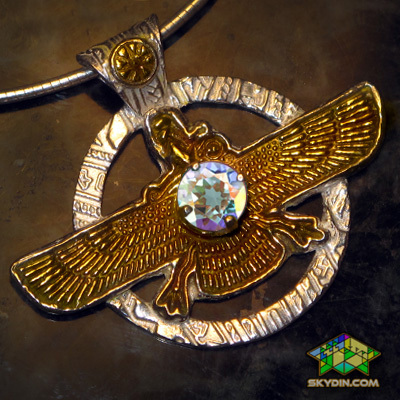 It involves a powerful psychic reading inwhich Skydin Zeal will read your chart with his incredible three-pronged method which includes the Scandinavian Runes, Ancient Egyptian Tarot and Numeology based on both Northern and Eastern systems! 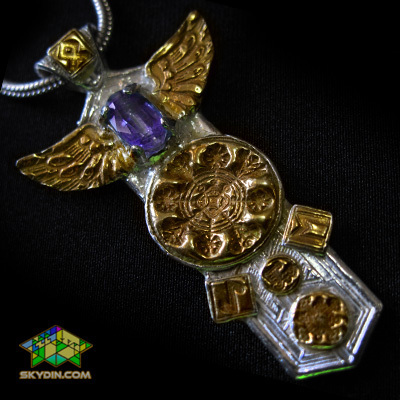 This leaves no room for error as he looks to help your spirit succeed from many points of view! 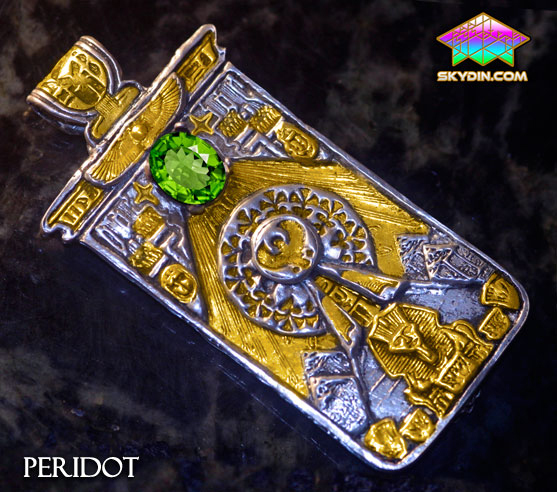 You then send a brief paragraph describing exactly what it is you would like to attain, and or what you would like to change. 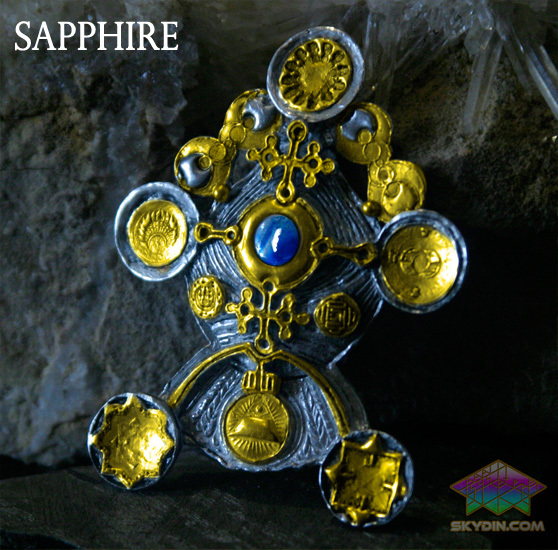 Several additional gemstones may be selected, the first additional gemstone is free as long as it has a skydin.com value of $14 or less. 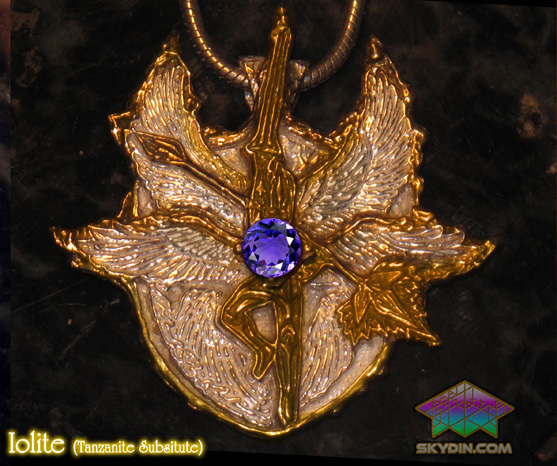 Please see the Archangel series secondary gemstones to view our below wholesale prices on more expensive gemstones! Skydin Zeal never profits from the gemstone you purchase, it is his desire to extend to you the cost that we actually pay on gemstones. 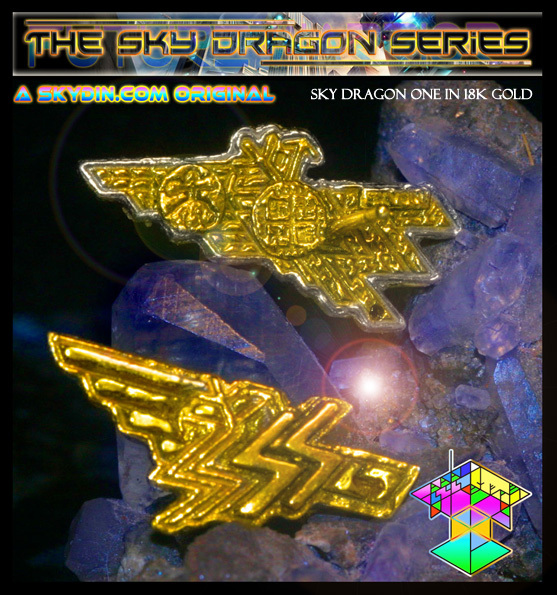 You can choose your own Symbols and designs from our 400+ Library of the most Powerful and Effective Symbols, which will then be individually made in fine silver and plated in 24k Gold. 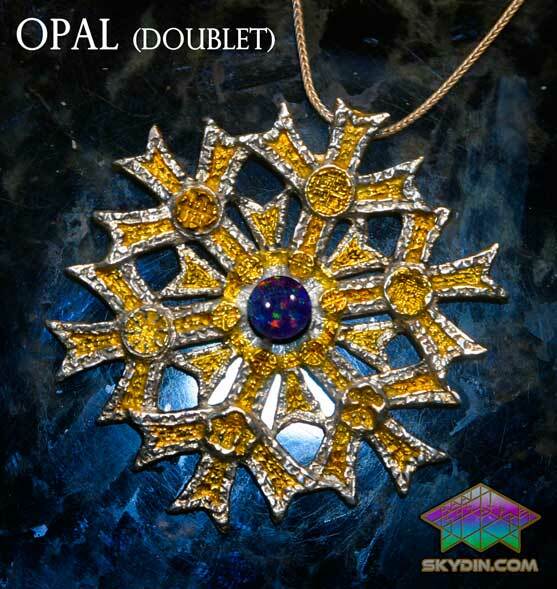 Or you can have Skydin Zeal channel purely for you! 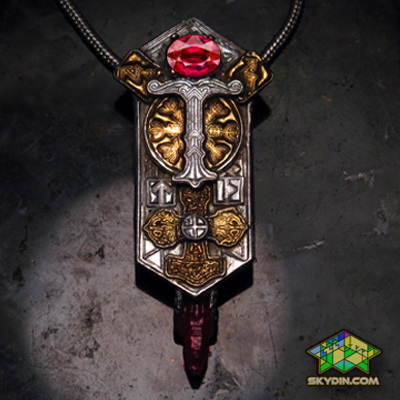 We will present to you a drawing by Skydin Zeal before he begins! 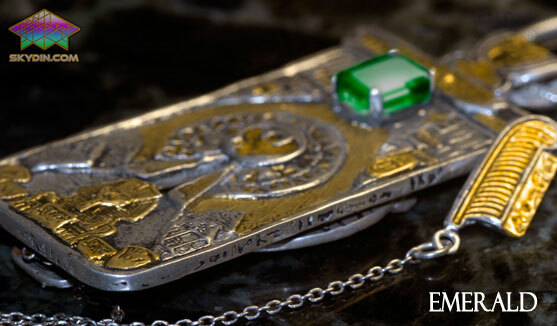 To initiate your Spiritually Customized Process simply add that to your cart at checkout! 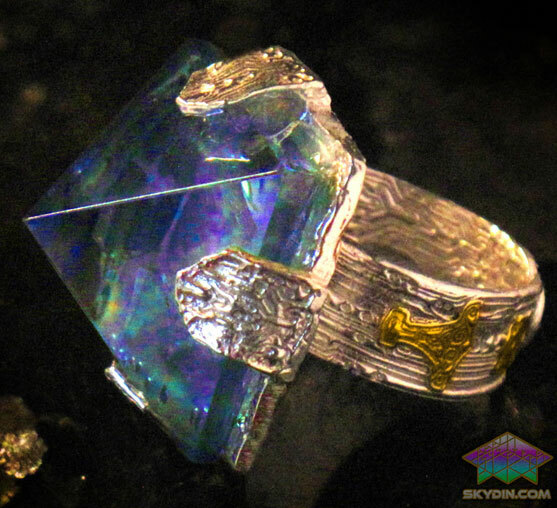 Gemstone Selection: Choose from Gold Aura Quartz, which is natural Optically Clear Quartz put in a Space Age Gold-Fusing Process whereby 24k Gold is Vaporized and due to the Quartz Crystal's natural piezo electric Surface Quality it permanently binds to the surface thus changing the color to a beautiful rainbow-like hue of Aqua with flashes of Pink, Purple and Gold! We have time and time again experienced this Gold-Aura Quartz to encourage Happiness, Joy and Healing. 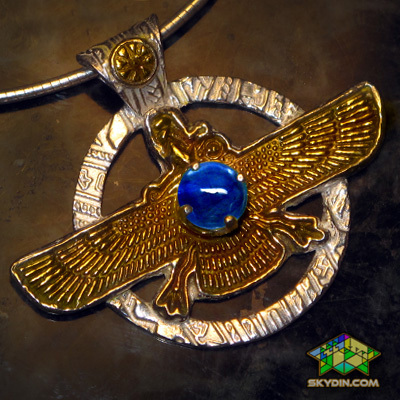 For more Spiritual improvement, enhancing the activity of your 3rd Eye and Psychic Protection Choose 100% Natural Lapis Lazuli or Green Aventurine for Healing and Attracting Abundance! More information on the particular properties of gemstones can be found on the net, but often it's best to go with one's natural intuition. 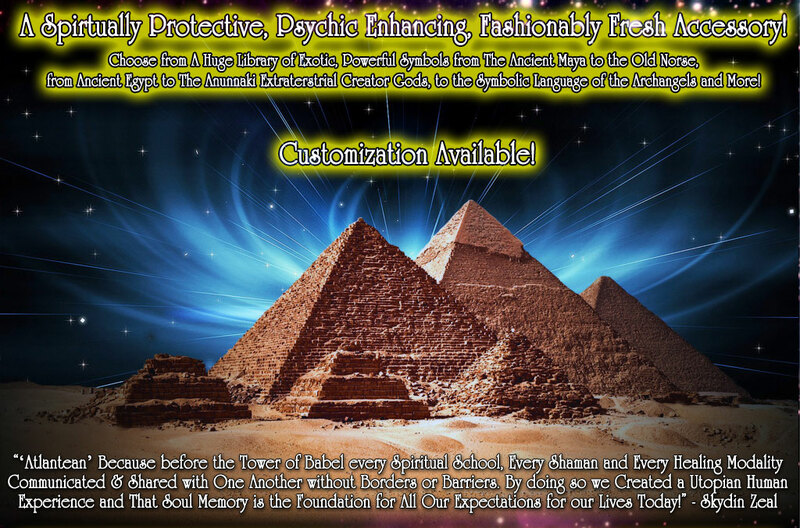 Spiritually Customized - Psychically Synchronized to You! 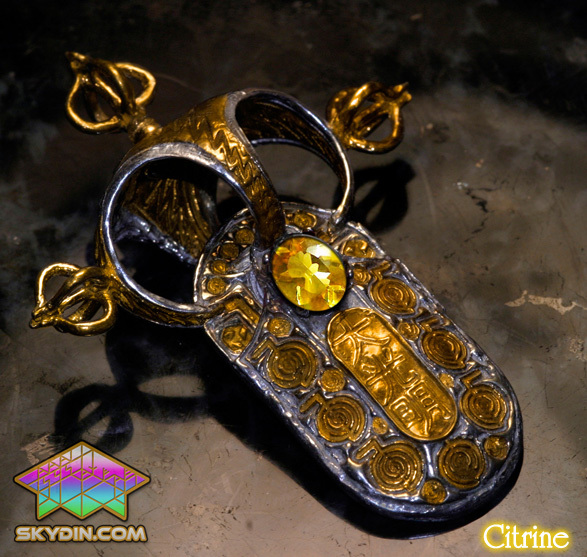 All Talisman Pendants and Rings created by Skydin Zeal are like living beings - they required genuine spiritual power, alot of careful thought, passion and months to be brought to life! 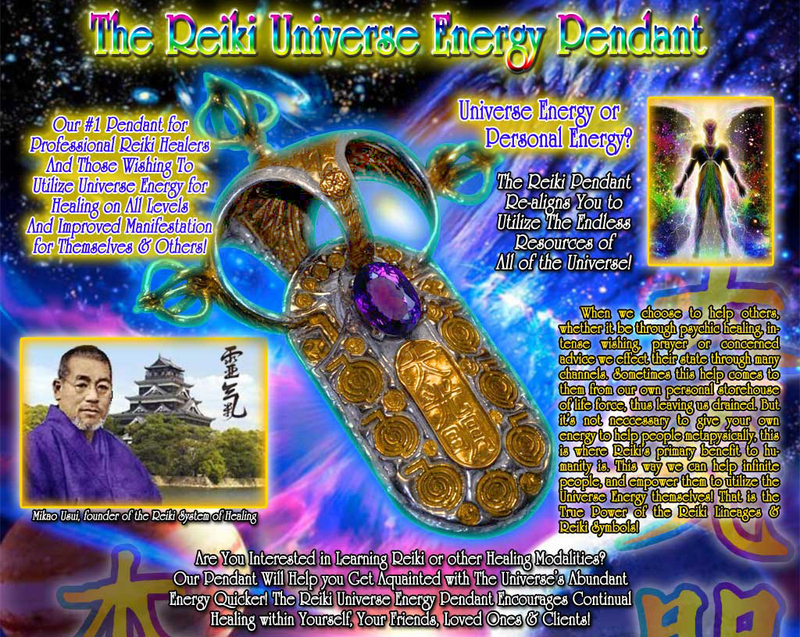 All of our products thusly are complete, energetically perfected, beautiful and holy! 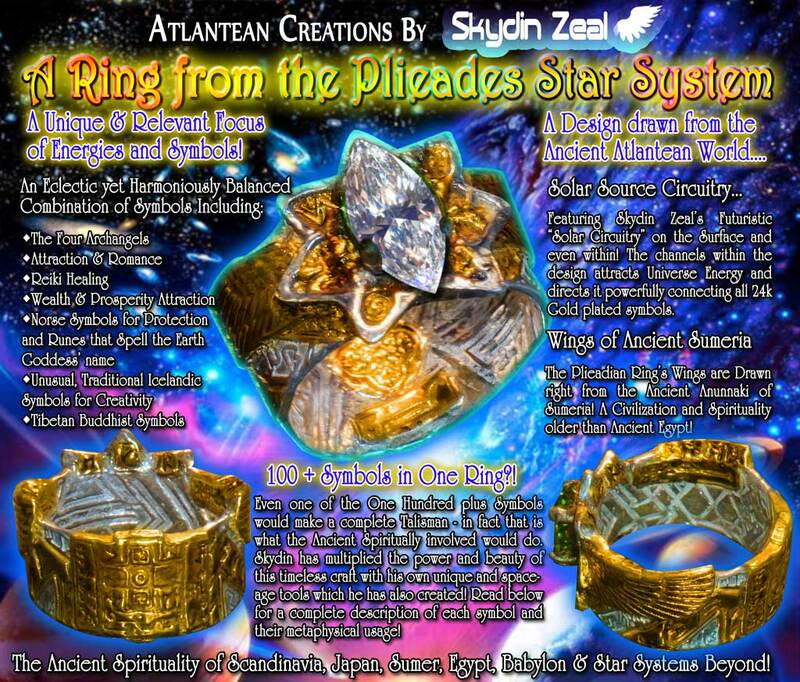 However all that you see here you can customized exactly to your specifications, frequency and goals! 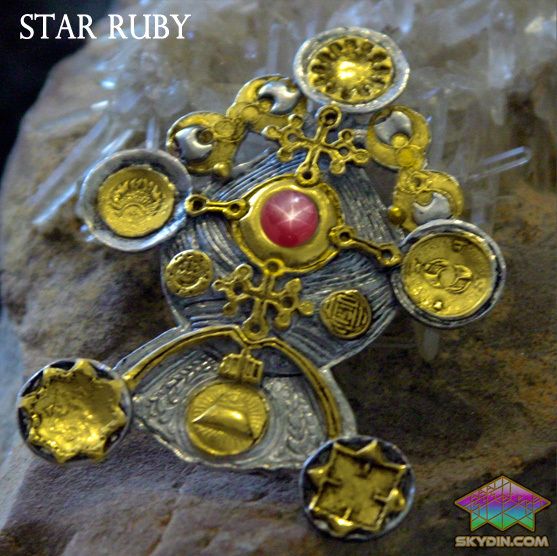 This means a totally unique work of everlasting spiritual fashion and art just foryou! 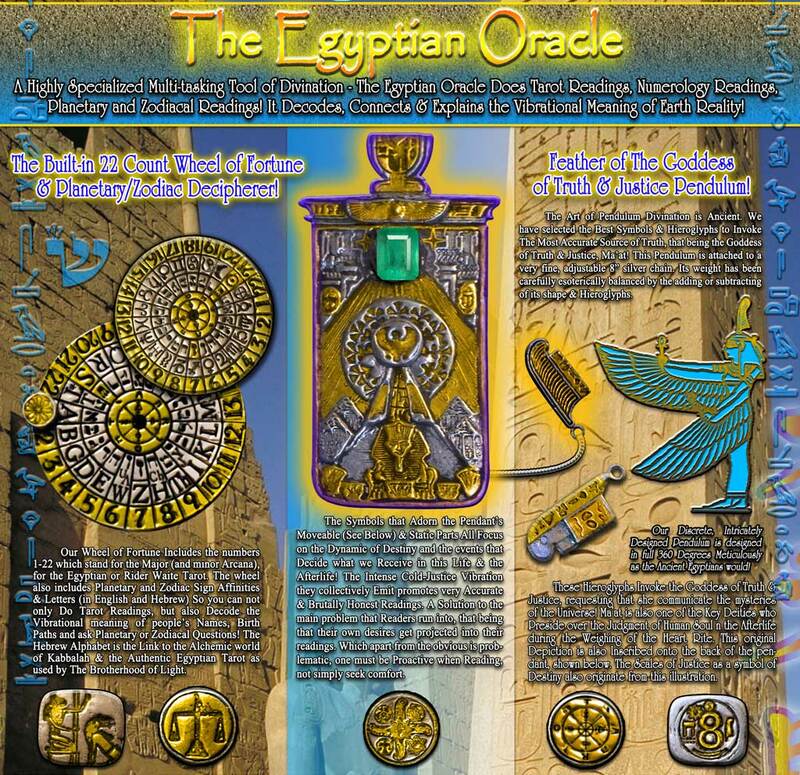 It involves a powerful psychic reading inwhich Skydin Zeal will read your chart with his incredible three-pronged method which includes the Scandinavian Runes, Ancient Egyptian Tarot and Numeology based on both Northern and Eastern systems! 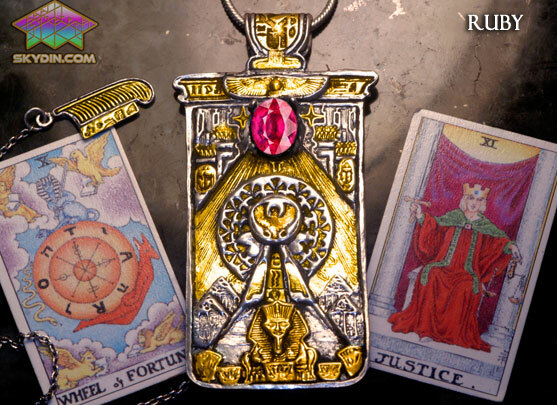 This leaves no room for error as he looks to help your spirit succeed from many points of view! 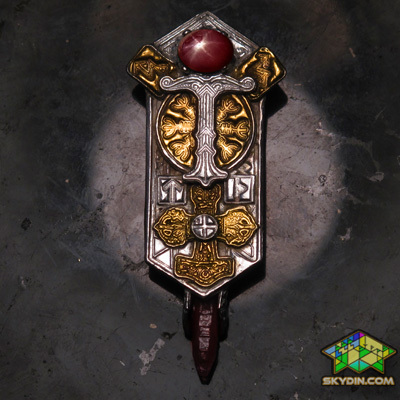 You then send a brief paragraph describing exactly what it is you would like to attain, and or what you would like to change. Several additional gemstones may be selected, the first additional gemstone is free as long as it has a skydin.com value of $14 or less. 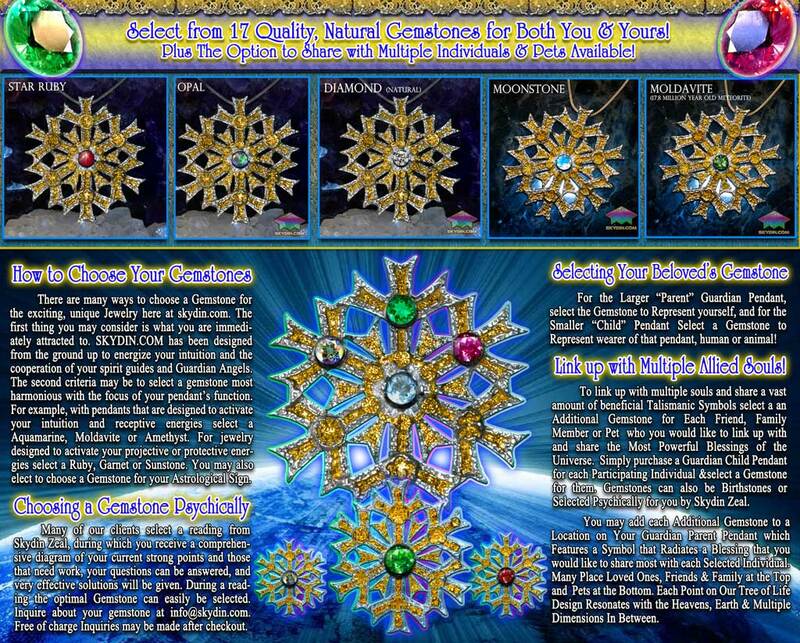 Please see the Archangel series secondary gemstones to view our below wholesale prices on more expensive gemstones! Skydin Zeal never profits from the gemstone you purchase, it is his desire to extend to you the cost that we actually pay on gemstones. 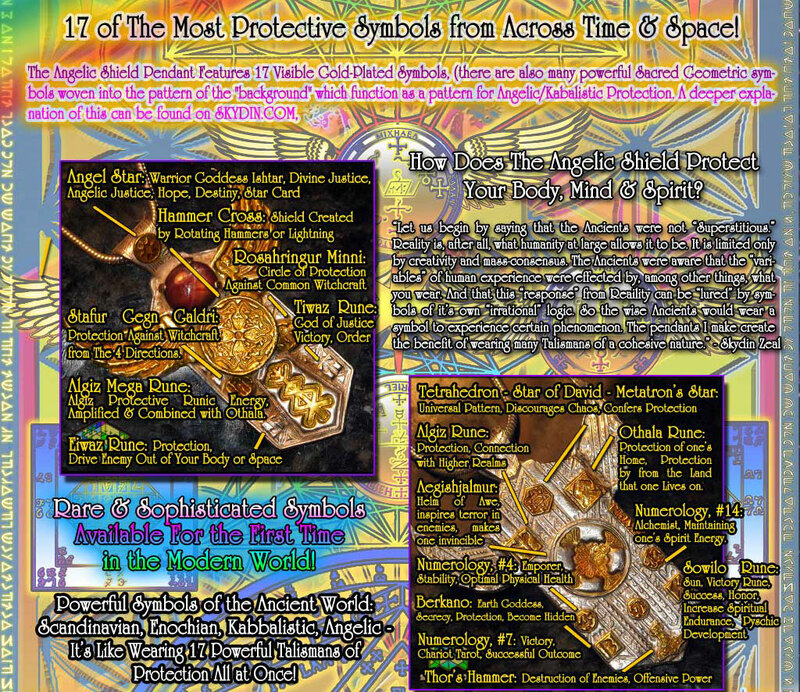 You can choose your own Symbols and designs from our 400+ Library of the most Powerful and Effective Symbols, which will then be individually made in fine silver and plated in 24k Gold. 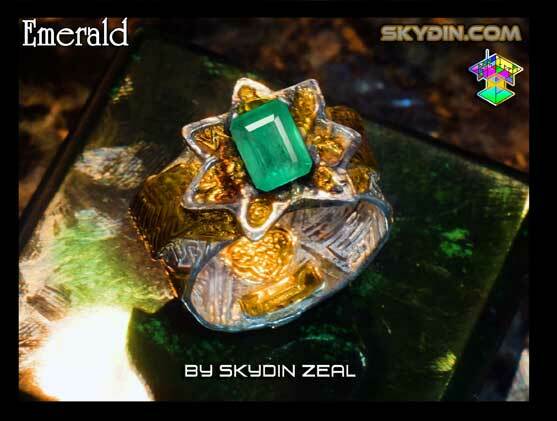 Or you can have Skydin Zeal channel purely for you! 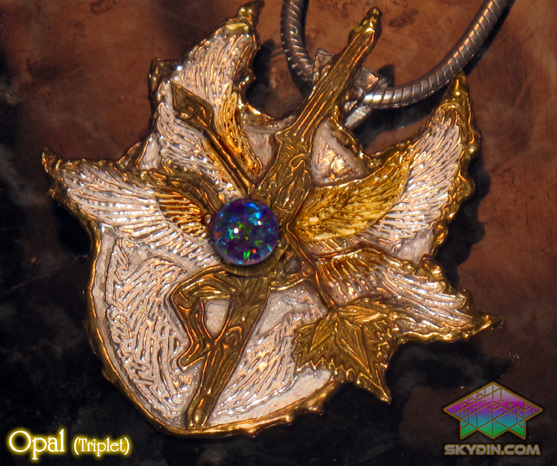 We will present to you a drawing by Skydin Zeal before he begins! 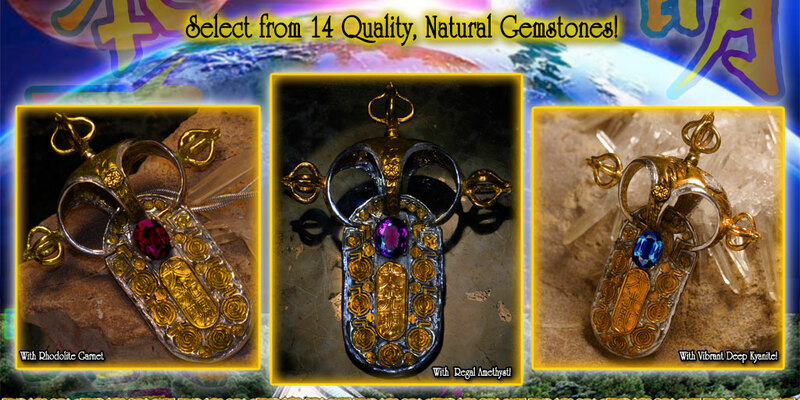 To initiate your Spiritually Customized Process simply add that to your cart at checkout! Master-Crafted Customized Soul Pendants and Soul Rings: If you Truly desire a Completely Unique, never-before seen Pendant, Ring, Bracelet, Broch or Earring set then Skydin Zeal's Master-Crafted Soul Jewelry is for you! 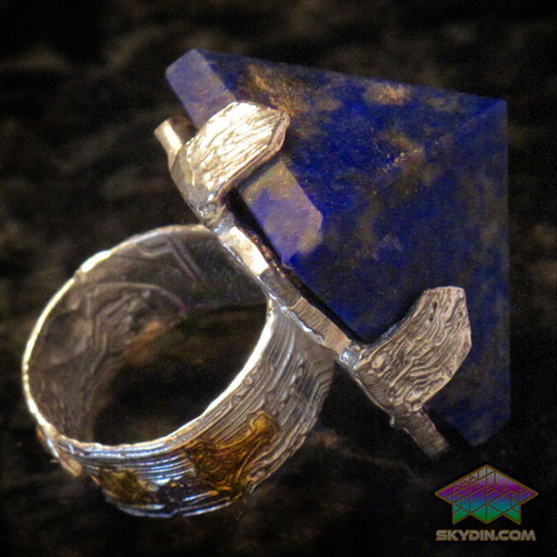 The same Soul-Matching Psychic Jewelry Creation Process as mentioned above - But what makes this one truly special is that you receive two rings! 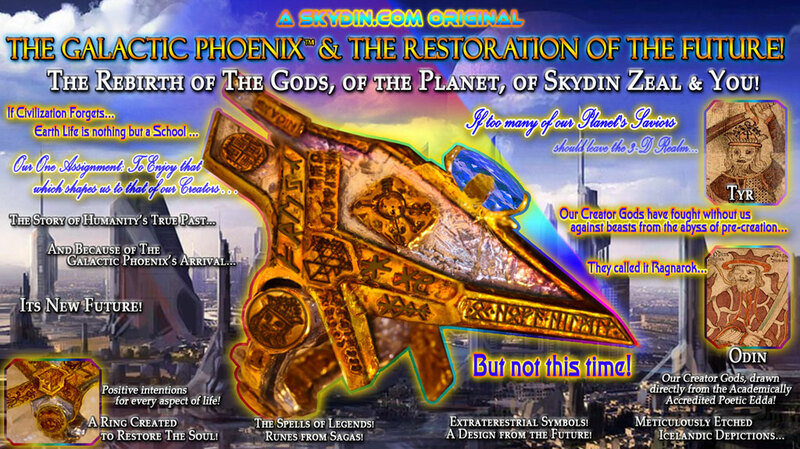 The pair will be similar works of art, beauty and expertise, yet like night and day they each have a specific affinity over the two halves of their realities. The original is handmade, in Pure Fine Silver (.999) and the secondary is machine-made in masterful, exact detail in Sterling, 14k, 18k, 22k, White Gold or Platinum (exotic metals be requested). Gemstones can be duplicated or different. If it is a Ring that you Require then you will be presented with similar rings, one for each hand, this we have discovered is energetically ideal! 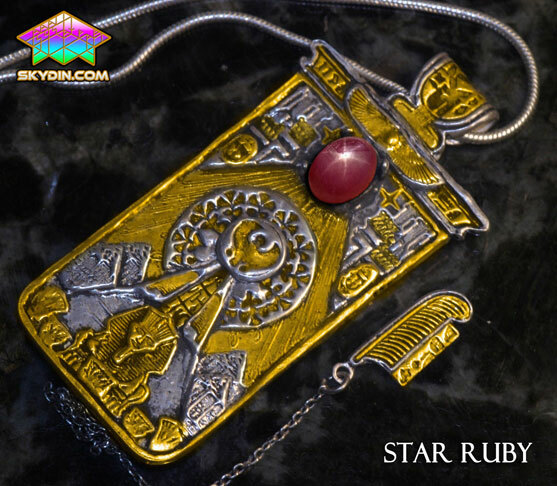 If it is a pendant then the secondary twin may be presented to someone of great importance in your life - forever blessing, connecting and protecting you both. 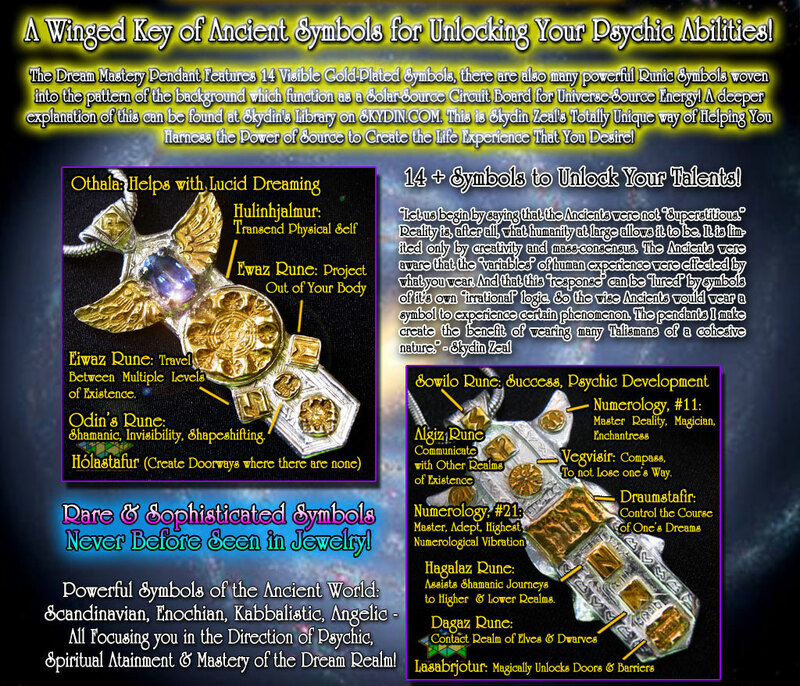 Or they can be designed to both be worn by you, with one used to attract positive experiences and in challenging days to deflect unwanted expeiences! 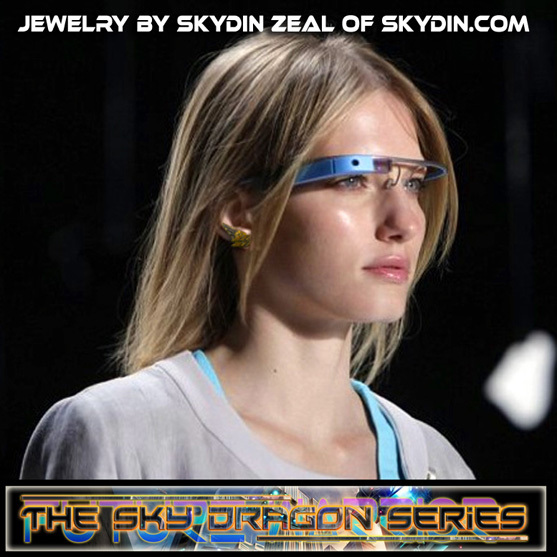 Or they can even be worn simultaneously at different heights! For Skydin Zeal's Master-Crafted Customization click here! 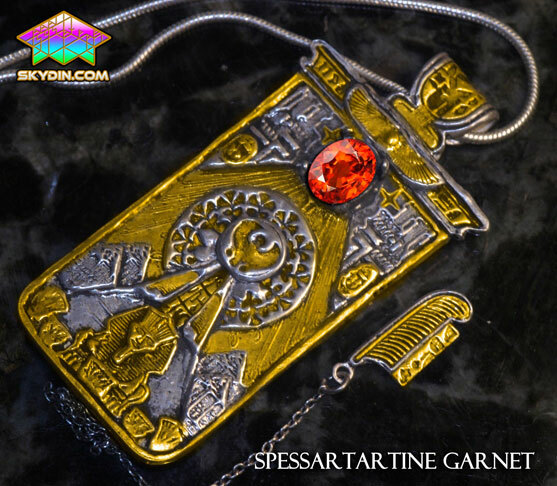 This pendant was created with 100+ Intense Symbols all relating to Divination, receiving answers from the Universe and The Ancient Egyptian Mysteries. 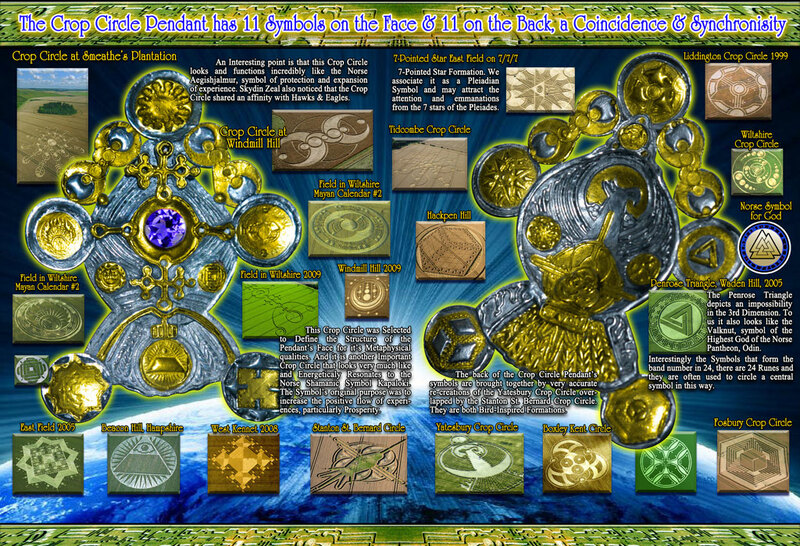 For An explanation on how a Symbol Generates an Experience click here. 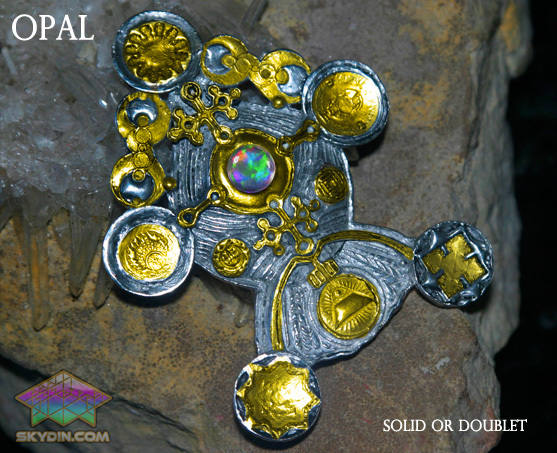 Technical Information:1 3/4" x 1" x 1/4" 46mm x 25mm x 5.9mm Weight: 14 grams, Composition: .929 Sterling Silver with 18k gold accents.